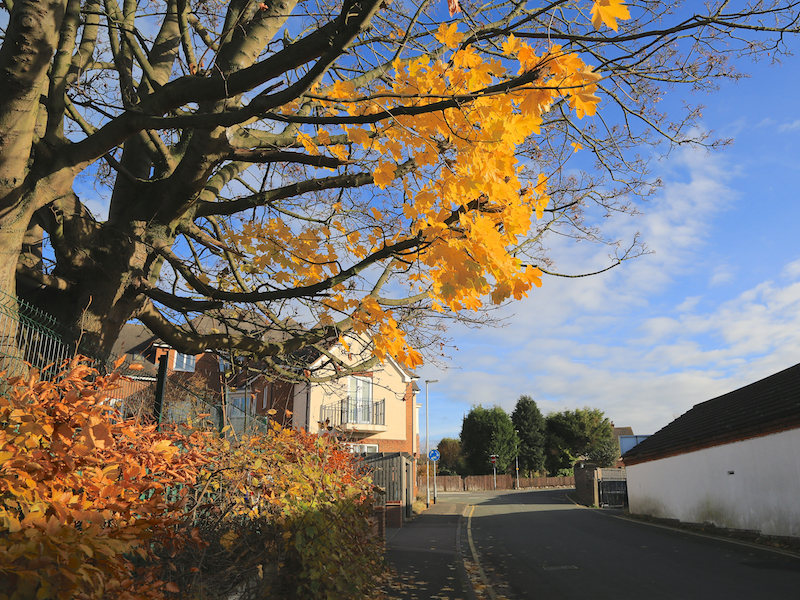 This circular walk starts at Lichfield City Station and follows a route around the city centre and across a meadowland. 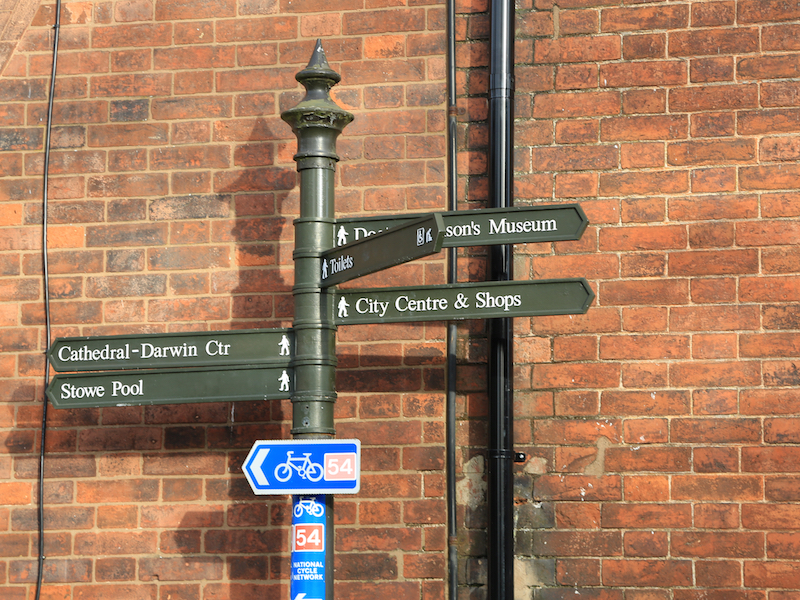 The route includes some short sections of The Heart of England Way and takes in a number of the key sites of interest in Lichfield, including museums and the city’s famous cathedral. 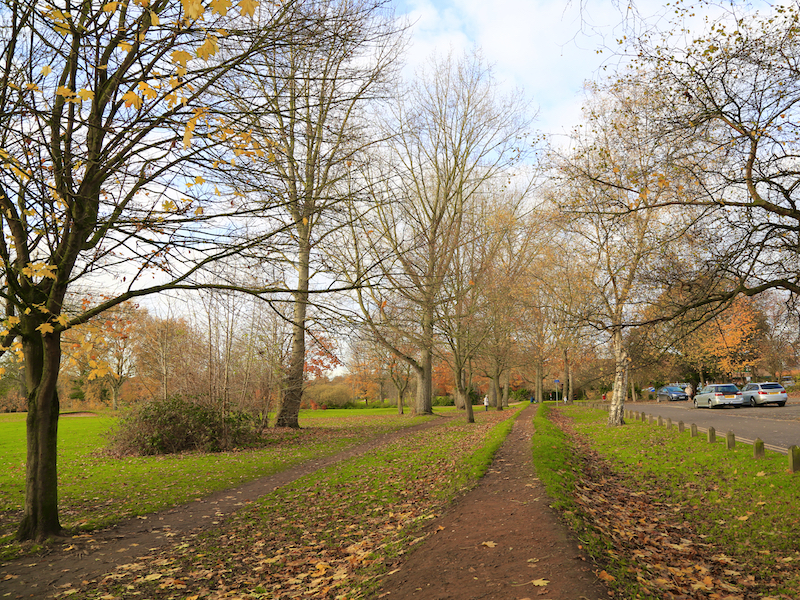 The route is relatively flat and mainly on well made paths and roads but with approximately 3/4 mile of parkland/field/meadowland paths which may include some muddy sections during wetter periods. There are two stiles to be crossed. 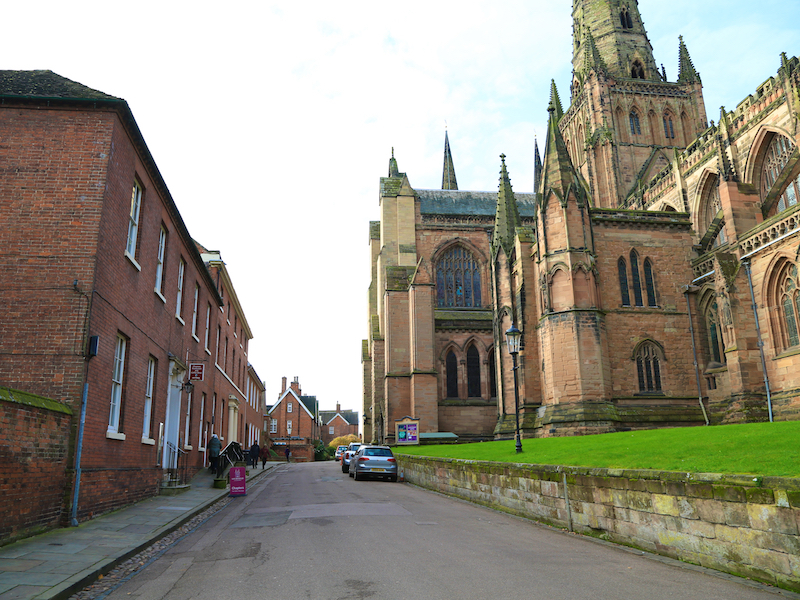 Lichfield is a cathedral city and civil parish in Staffordshire, one of eight civil parishes with city status in England. 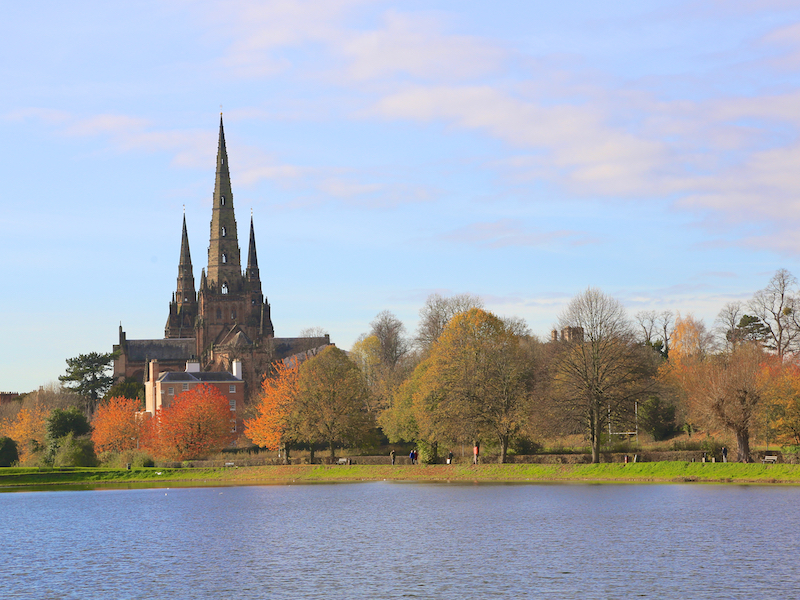 Lichfield is16 mi (26 km) north of Birmingham. 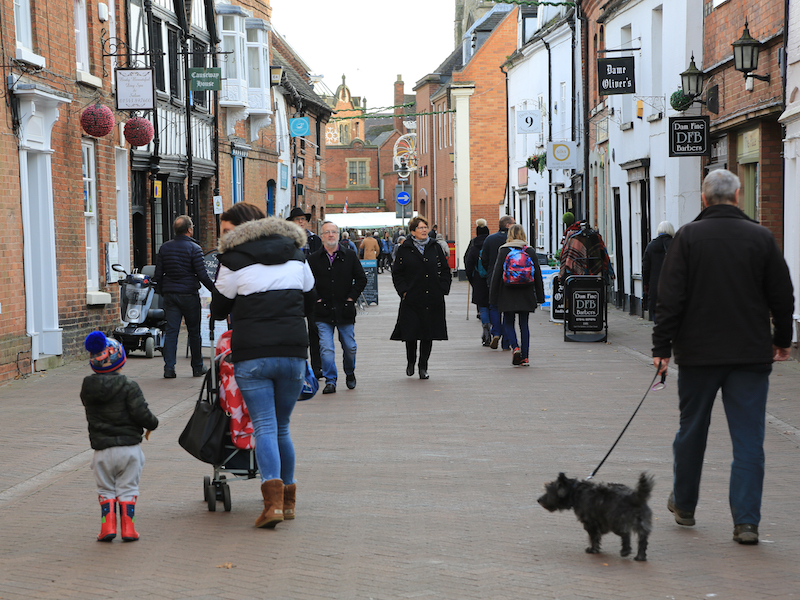 At the 2011 Census the City population was 32,219 and the wider Lichfield District at 100,700.
Notable for its three-spired medieval cathedral, Lichfield was the birthplace of Samuel Johnson, the writer of the first authoritative Dictionary of the English Language. 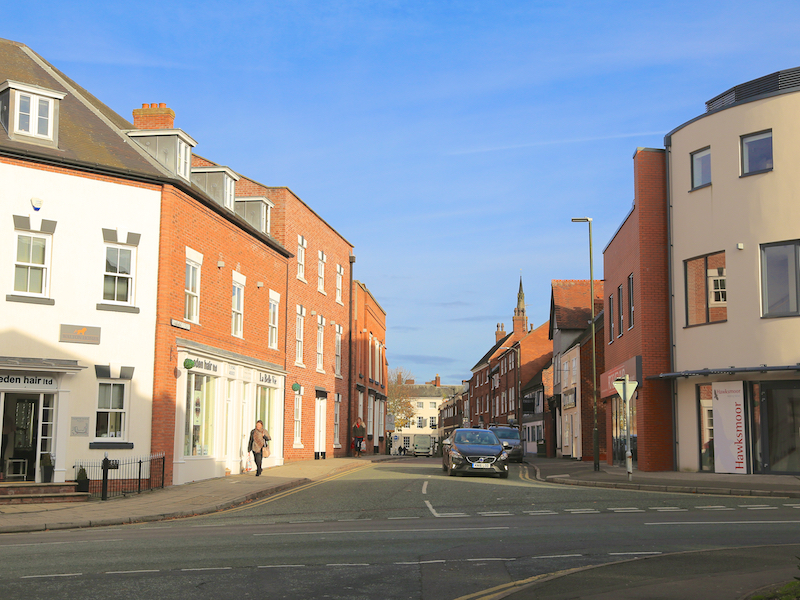 The city’s recorded history began when Chad of Mercia arrived to establish his Bishopric in 669 AD and the settlement grew as the ecclesiastical centre of Mercia. In 2009, the Staffordshire Hoard, the largest hoard of Anglo-Saxon gold and silver metalwork, was found 3.7 miles south-west of Lichfield. 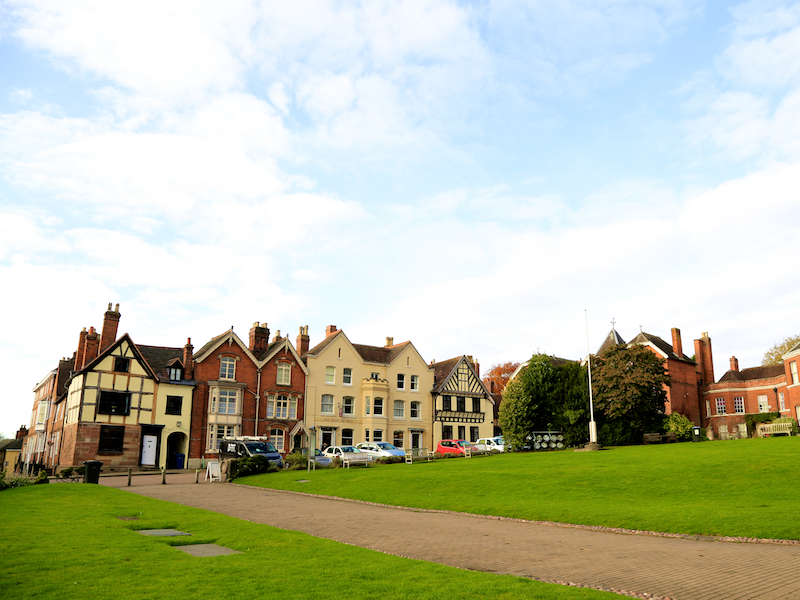 In the 12th century Roger de Clinton fortified the Cathedral Close and laid out the town with the ladder-shaped street pattern that survives to this day. 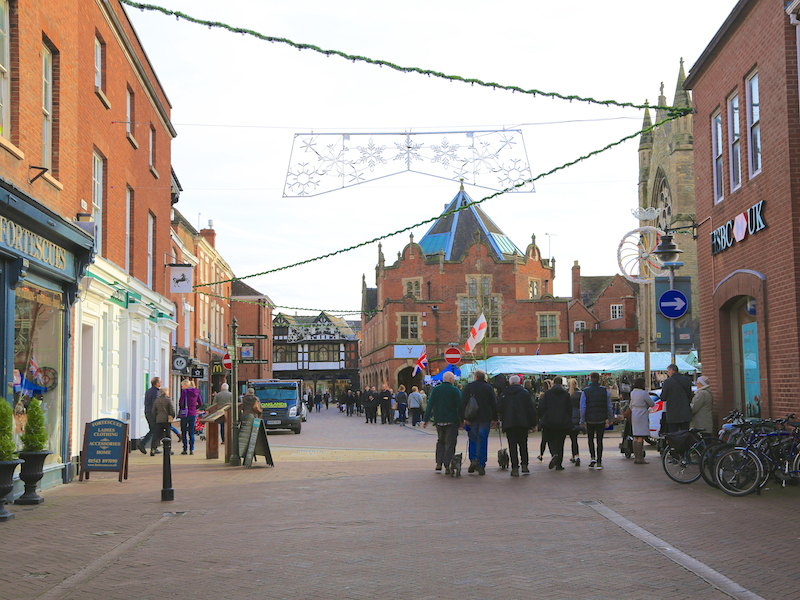 Lichfield’s heyday was in the 18th century, when it developed into a thriving coaching city. 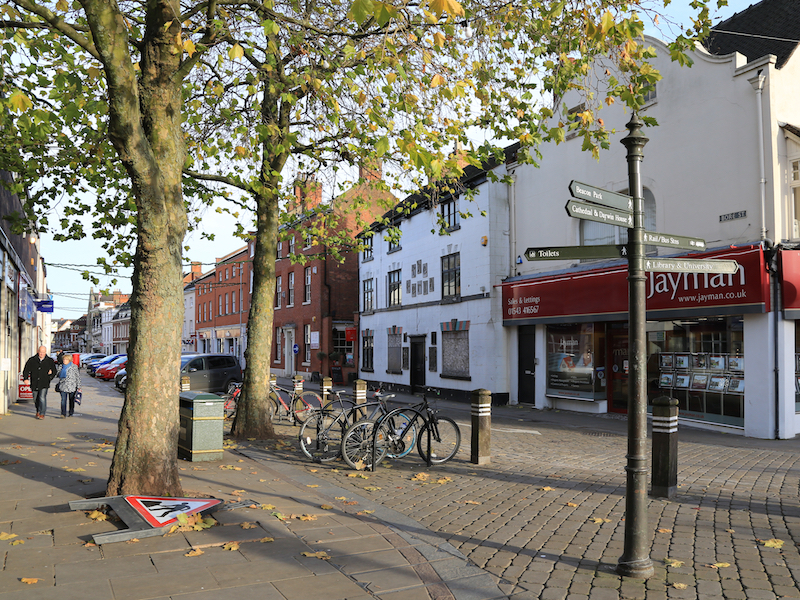 This was a period of great intellectual activity, the city being the home of Samuel Johnson, David Garrick, Erasmus Darwin and Anna Seward, and prompted Johnson’s remark that Lichfield was “a city of philosophers”. Today, the city retains its importance as an ecclesiastical centre. Industrial and commercial development has been limited. 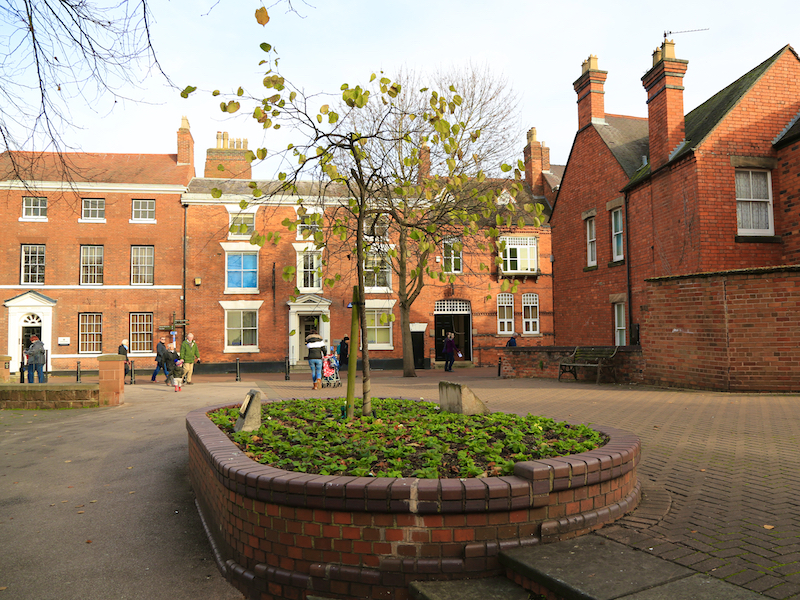 The centre of the city has over 230 listed buildings (including many examples of Georgian architecture), and preserves much of its historic character. 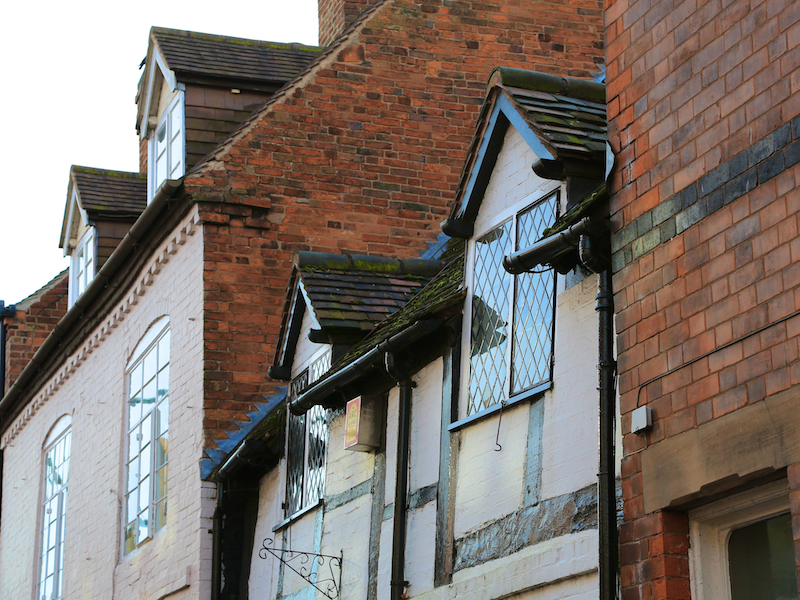 In the Middle Ages, the main industry in Lichfield was making woollen cloth; there was also a leather industry. Much of the surrounding area was open pasture, and there were many surrounding farms. 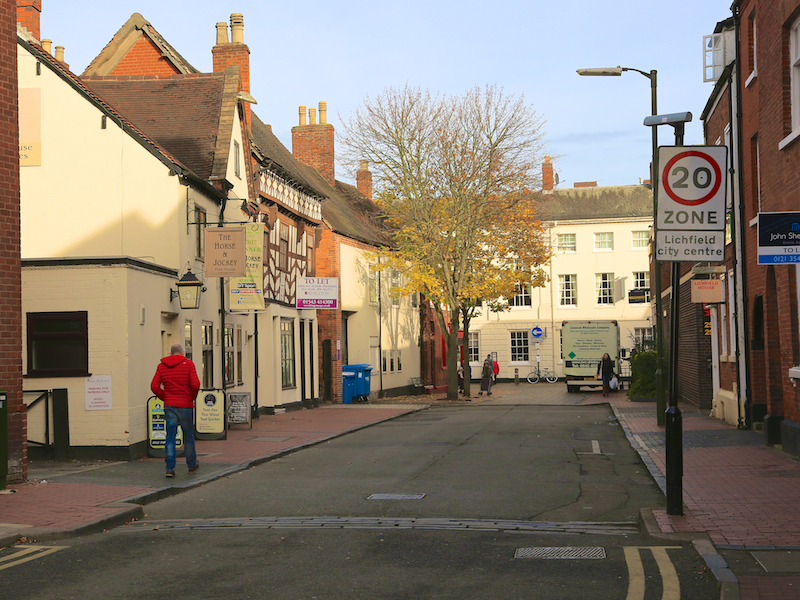 In the 18th century, Lichfield became a busy coaching centre. 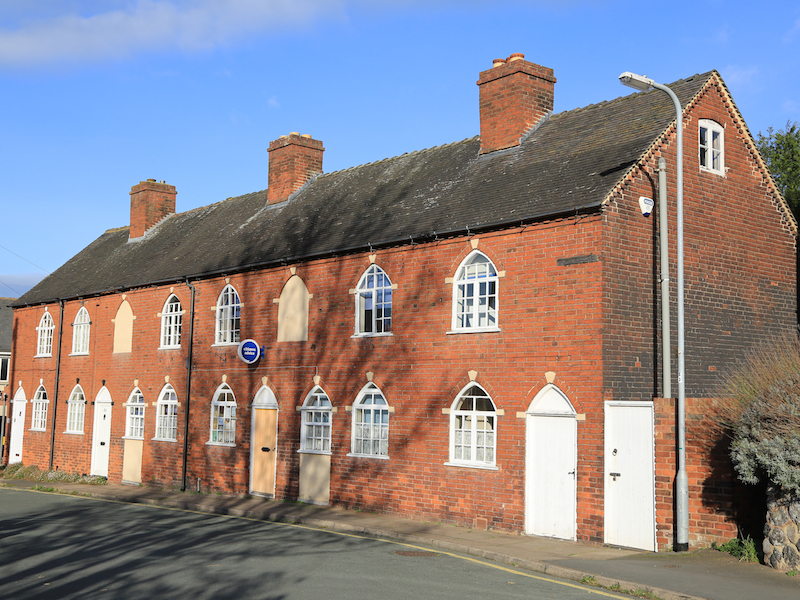 Inns and hostelries grew up to provide accommodation, and industries dependent on the coaching trade such as coach builders, corn and hay merchants, saddlers and tanneries began to thrive. The City’s main source of wealth was generated by its many visitors. 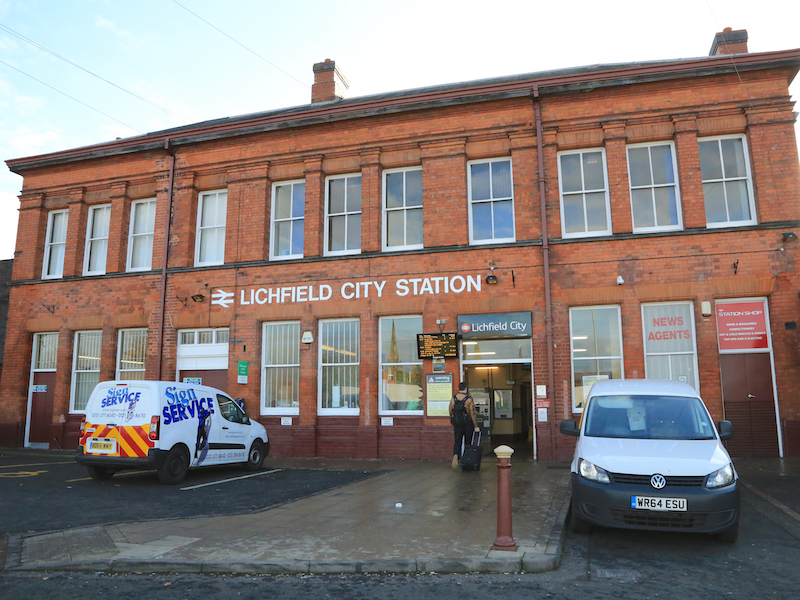 The invention of the railways saw a decline in coach travel, and with it came the decline in Lichfield’s prosperity. 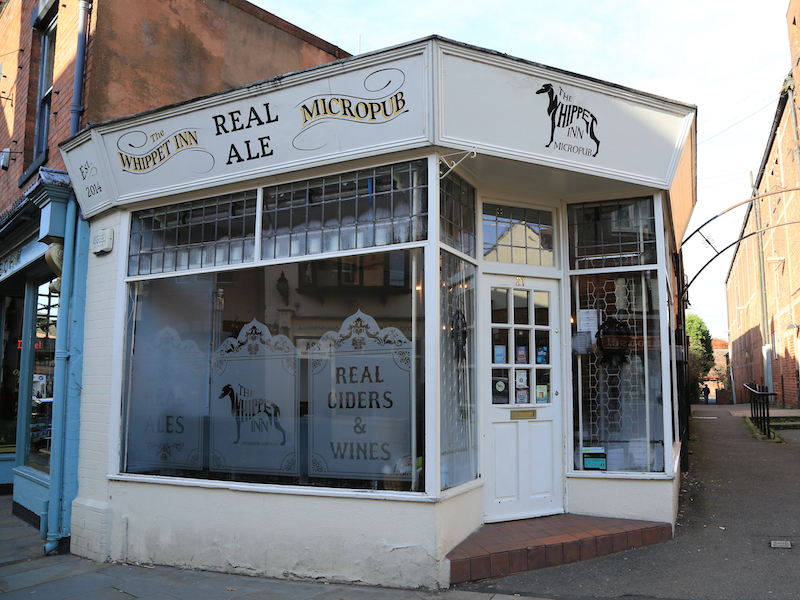 By the end of the 19th century, brewing was the principal industry, and in the neighbourhood were large market gardens which provided food for the growing populations of nearby Birmingham and the Black Country. 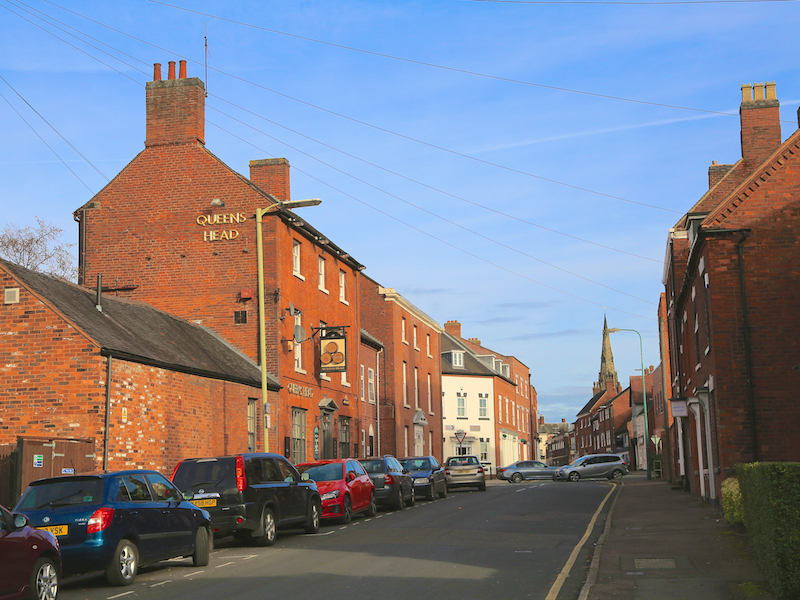 The district is famous for two local manufacturers: Armitage Shanks, makers of baths/bidets and showers, and Arthur Price of England, master cutlers and silversmiths. 1. 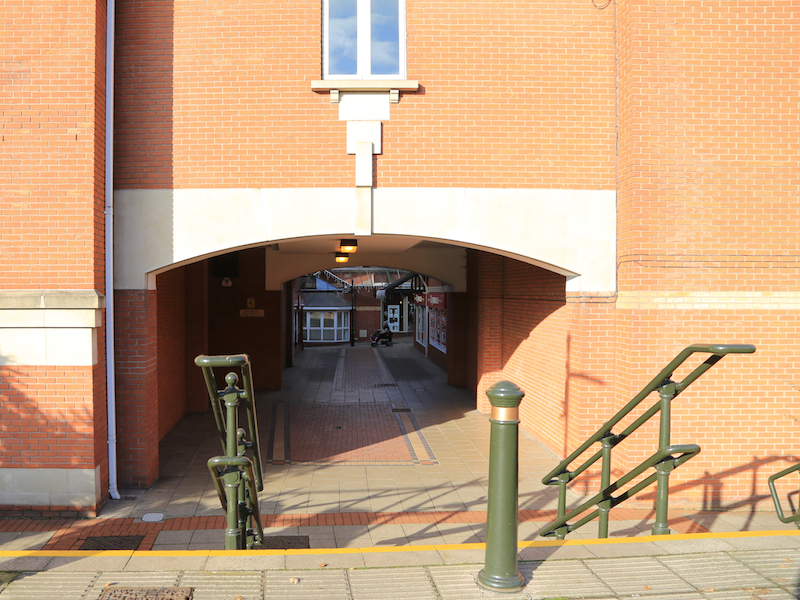 From the entrance to Lichfield City station, take the road immediately to the right (Station Road) that approaches from the main road and then rises gradually and turns slightly to the right. 2. 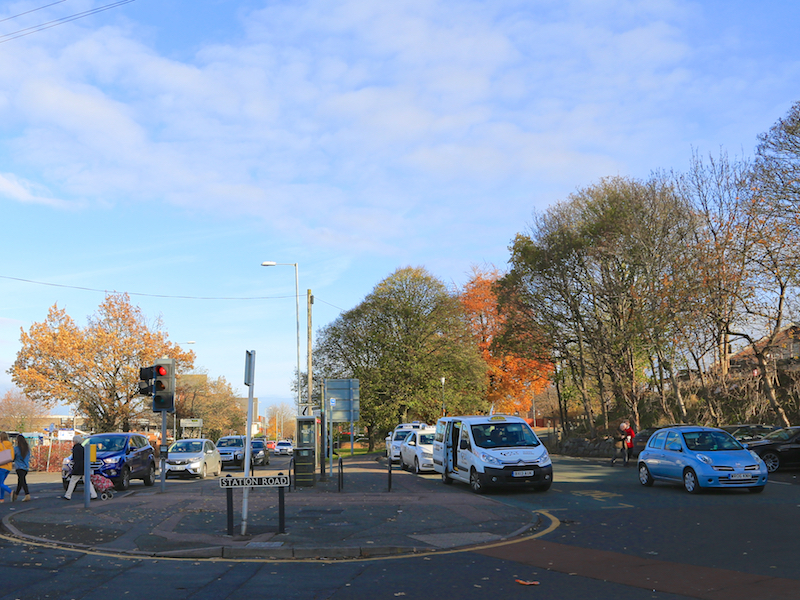 On reaching the small roundabout, turn left into Levetts’ Field and continue until the pedestrian crossing (Birmingham Road). 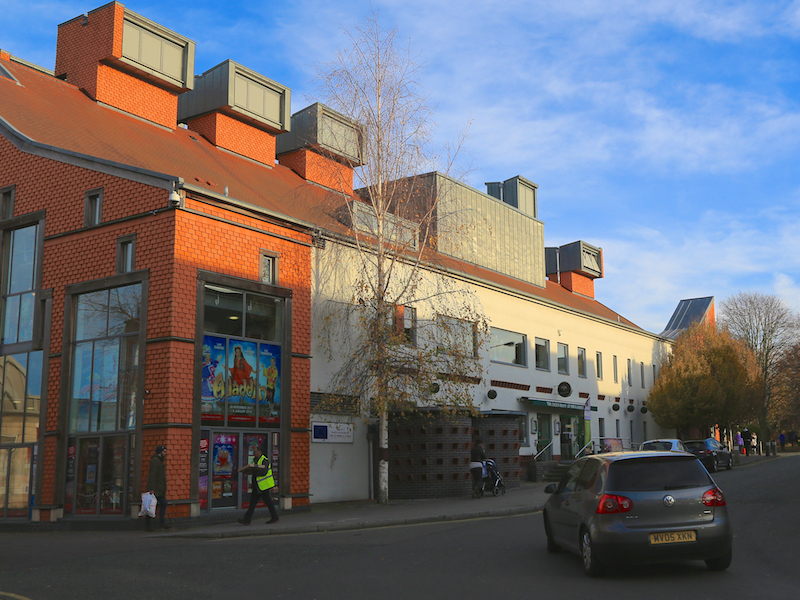 Note the fine brick building on the right, housing the Citizens’ Advice Bureau. 3. 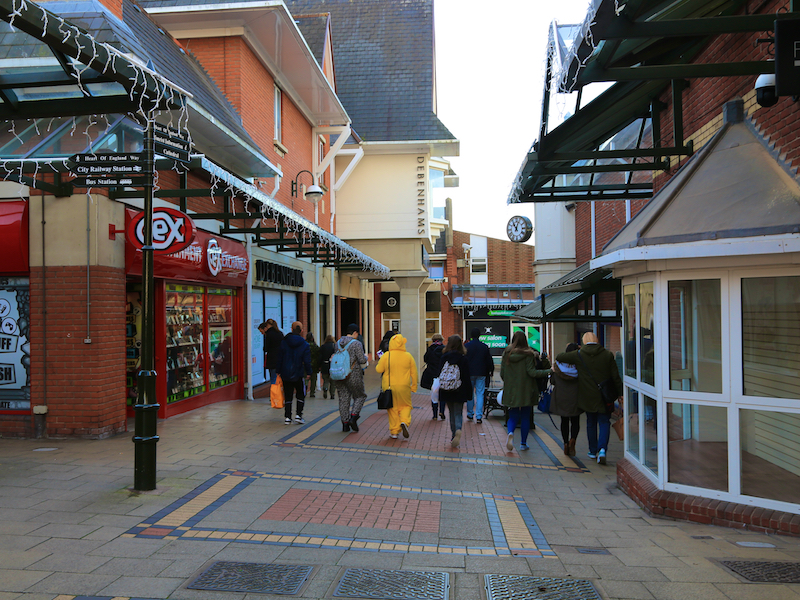 Cross the road and head along the pedestrian way into the shopping area. 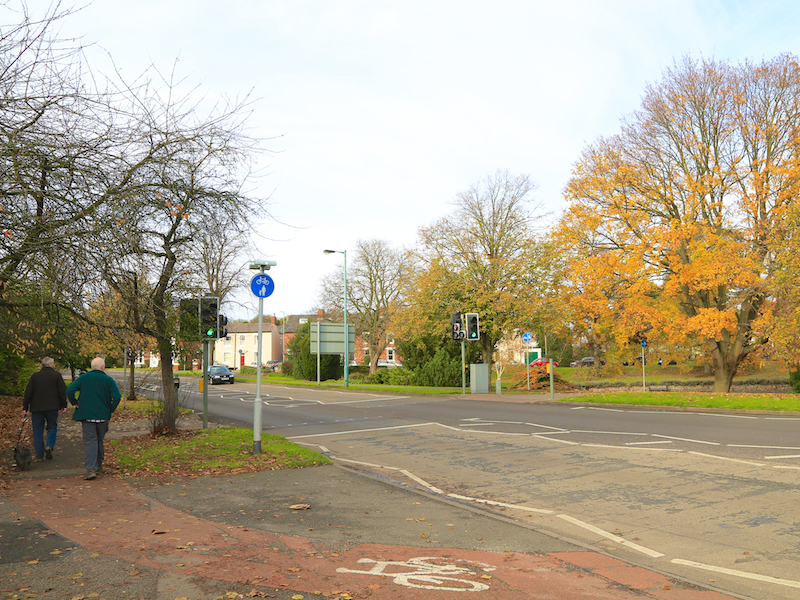 On reaching the T junction (Baker’s Lane), turn left, following the sign for Heart of England Way. 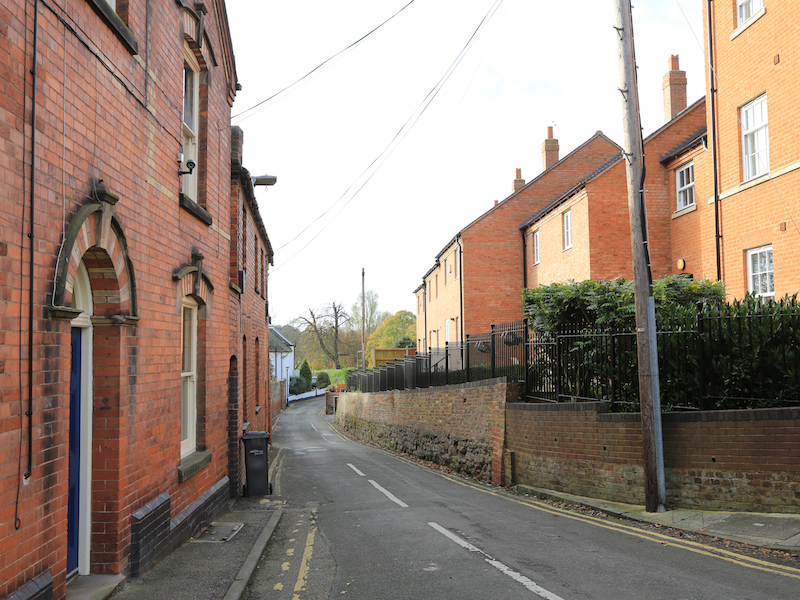 Follow Baker’s Lane as it turns right and head down the slight incline until reaching the paved road junction adjacent to the Corn Exchange building. 4. 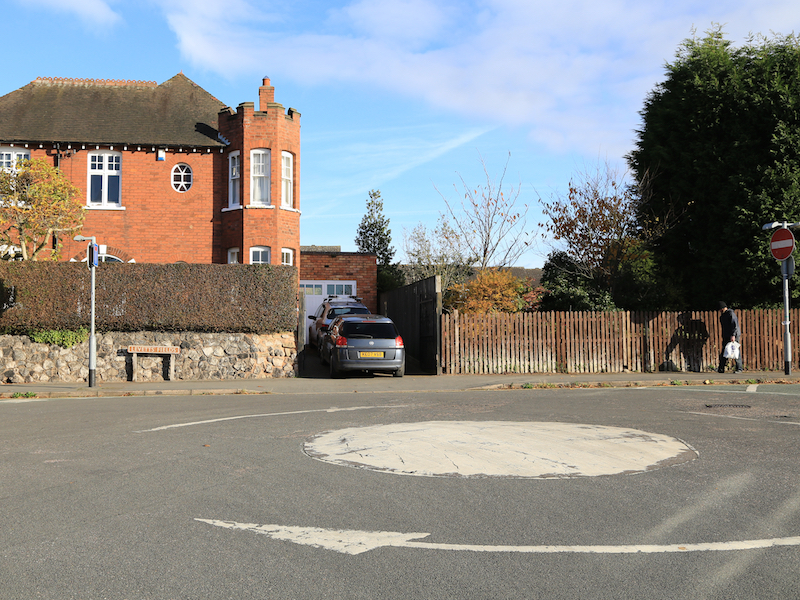 Bear right into Tamworth Street, pass (and/or visit) the Whippet Inn on the left and continue until reaching a junction on the left. 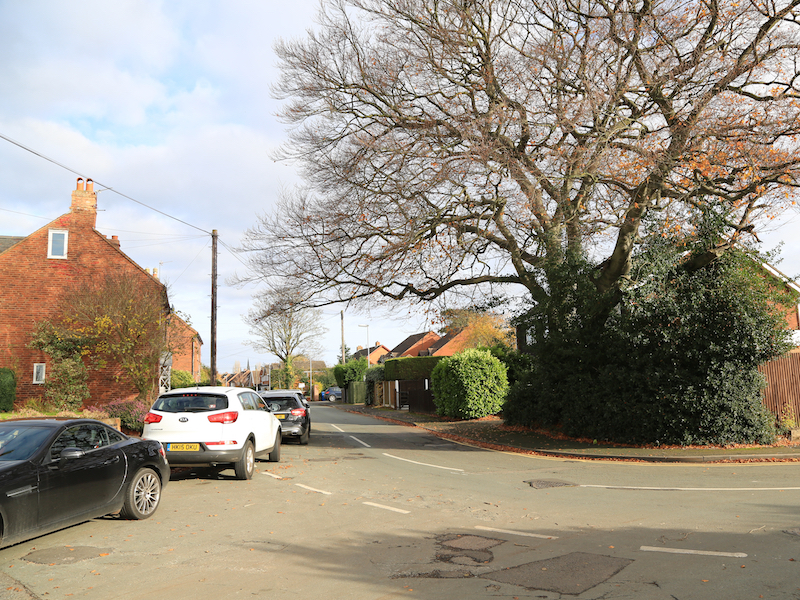 Here, turn left into Lombard Street and continue until reaching a road on the left, Cross Keys. 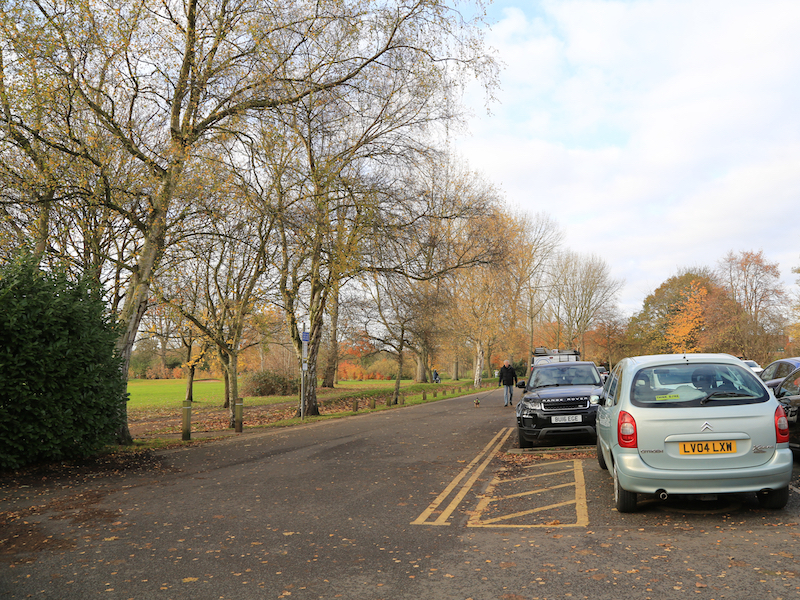 Take this road and after a short distance, instead of following the road as it bends to the left, head straight on to the right of the car park. 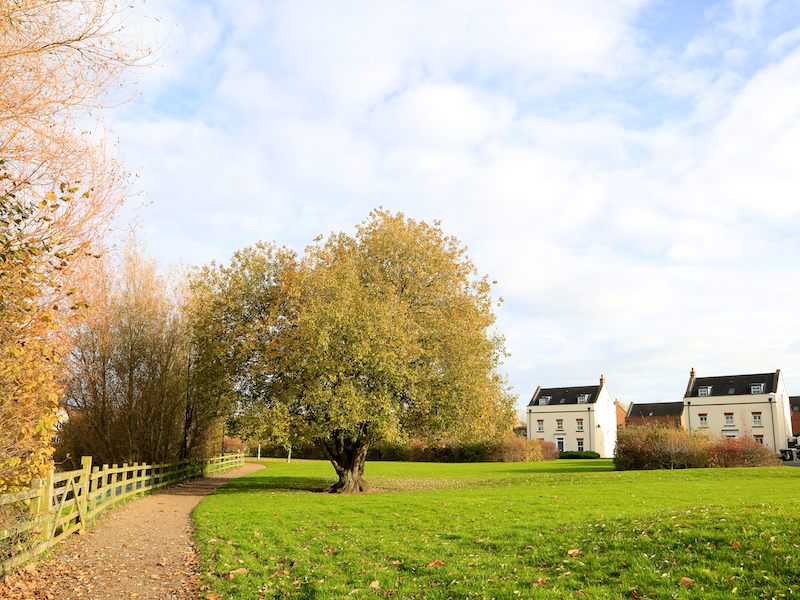 Go across the grass, bearing right to join the path that goes around the large pool ahead (Stowe Pool). Stowe Pool along with Minster Pool and the Bishop’s Pool were valuable fisheries. 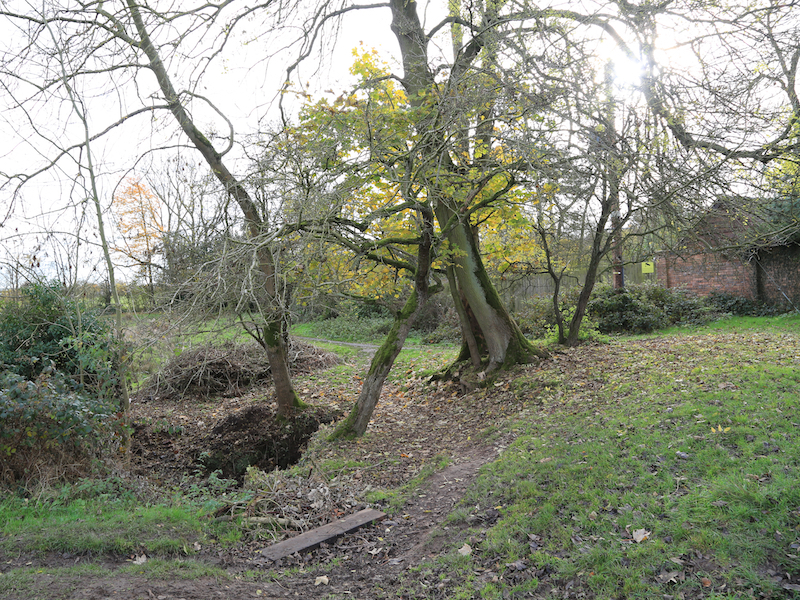 In the 18th century the mill stream on Reeve Lane divided to flow into Stowe Pool as two streams. 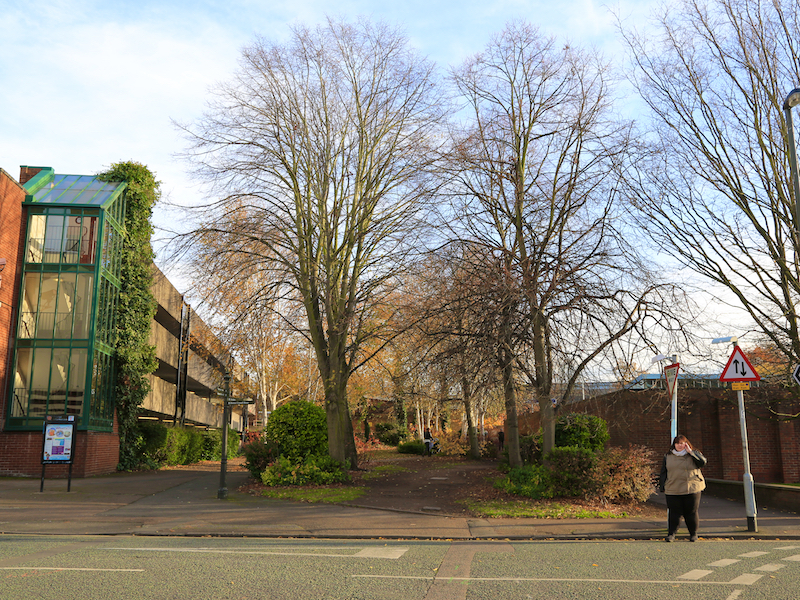 A conduit carries Leomansley and Trunkfield brooks under Museum Gardens and Bird Street into Minster Pool. The water is fed into a pipe under Dam Street and Stowe Fields, and then into Stowe Pool. 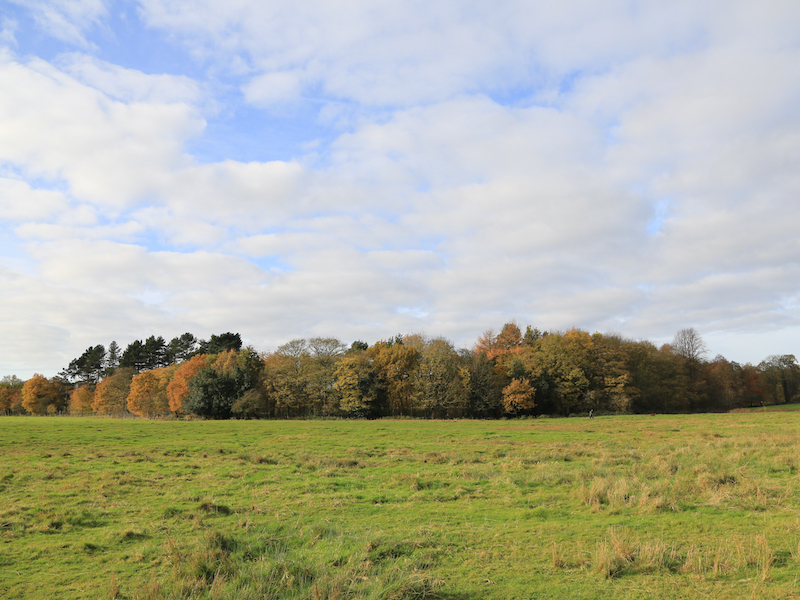 Many of the fields in this area were referred to as ‘moggs’, a word peculiar to Lichfield meaning boggy ground. 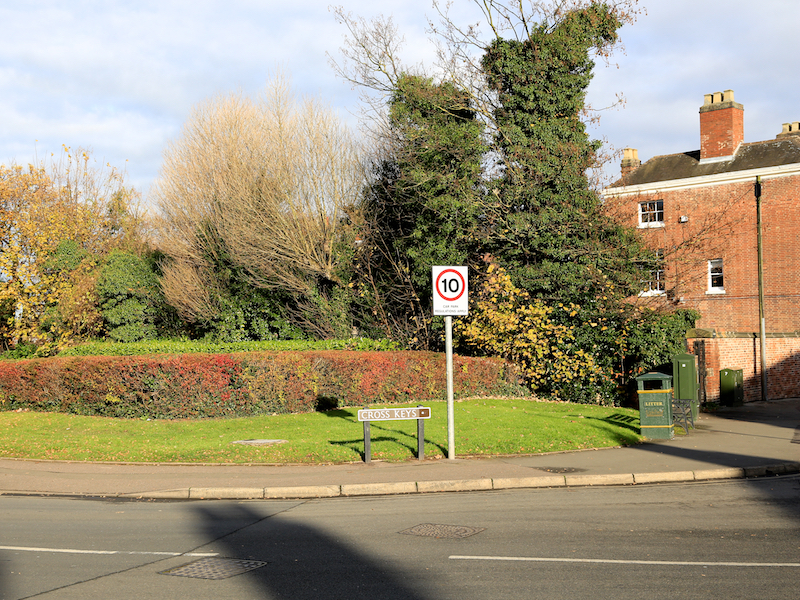 The ground to the south of Stowe Pool was occupied by long narrow gardens belonging to the houses on Lombard Street. Before 1856, Stowe Pool existed as a mill pond, with Stowe Mill located to the west of St Chad’s Church. On the north side of the pool, Samuel Johnson’s father owned a parchment factory, today commemorated by the street name The Parchments. Nearby stood Johnson’s Willow, an which became famous for its great size. 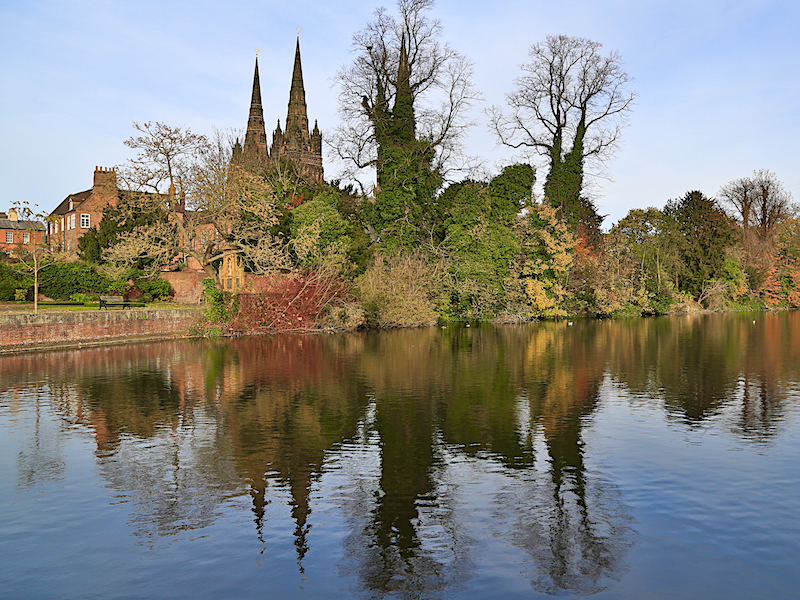 It was much admired by Johnson, who always visited it whenever he returned to Lichfield in later life. The current Johnson’s Willow on the site is a descendant of the original. 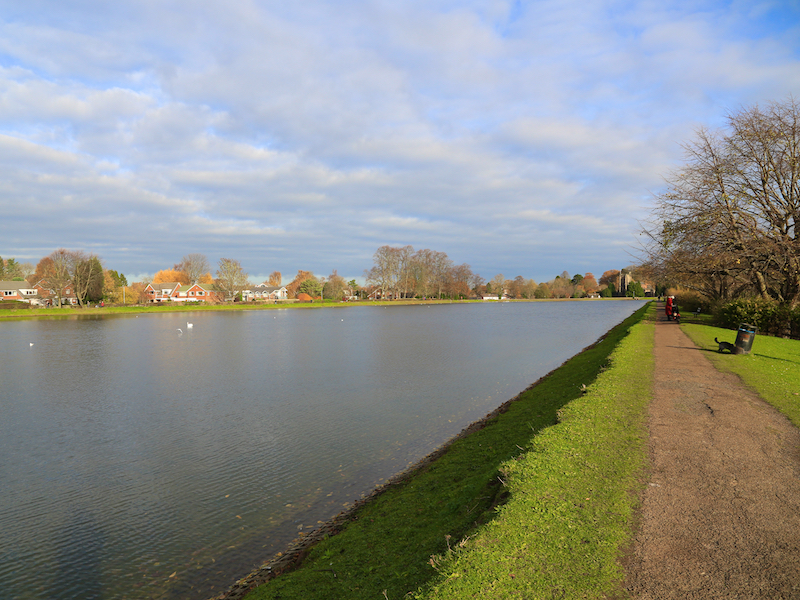 Stowe Pool was taken over by the South Staffordshire Waterworks Company in 1856, and was made into a reservoir. This man-made structure is around six metres higher than the original ground level. During construction, the water company planted ornamental trees and created a new path along the top of the embankment. 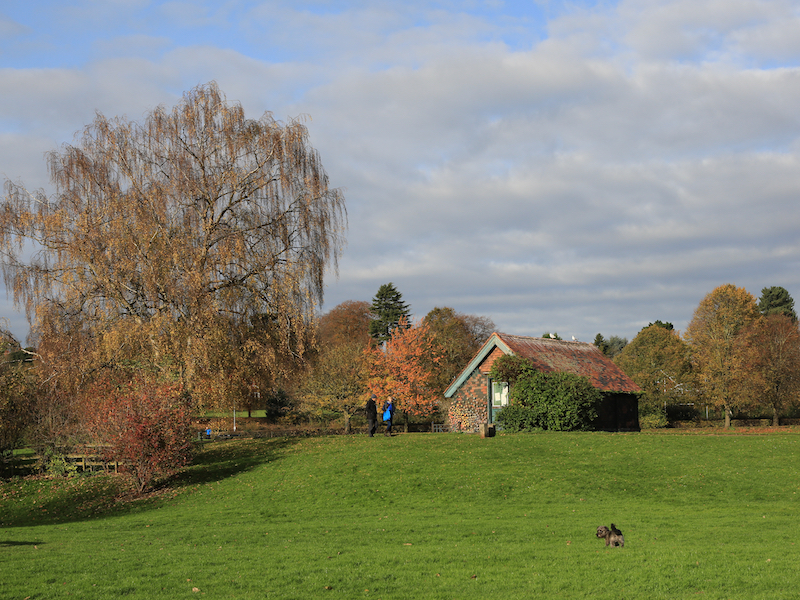 The boathouse was built around 1890. Since 1968 the reservoir has not been used to supply water, and it is now solely used for recreation. 5. 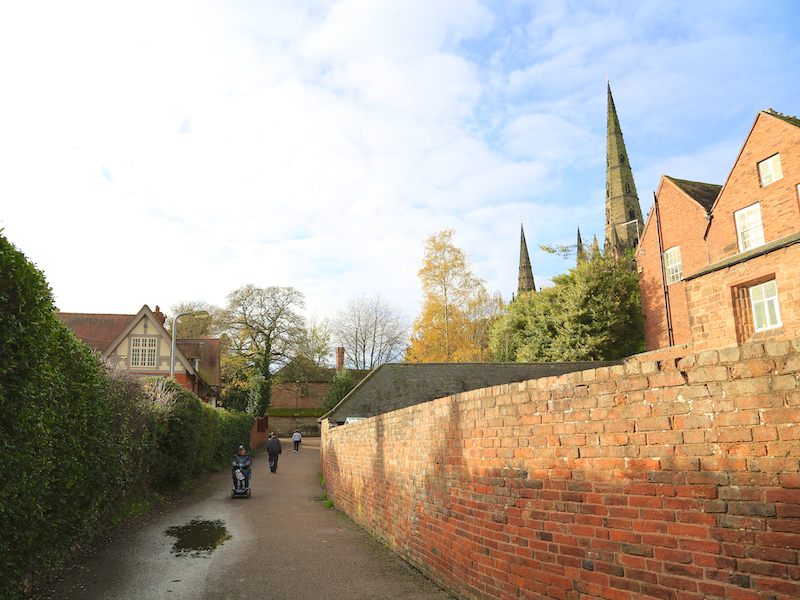 Follow the path around the pool past St Chad’s Church and just before completing the entire loop of the pool, continue straight ahead along the path that passes between two hedgerows and heads in the general direction of the cathedral’s spires. 6. Pass beyond Bishops Walk and continue ahead until reaching the T junction (Dam Street). Turn right and head towards the cathedral. On reaching the T junction, turn left (The Close) as it heads alongside and then beyond the cathedral. 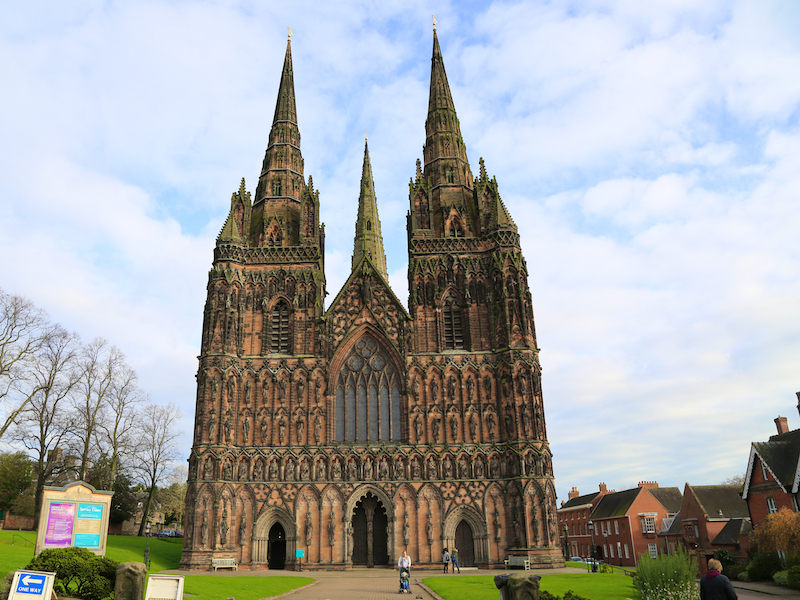 Lichfield Cathedral: Christmas Day 700 saw the consecration of the first cathedral in Lichfield, and, as there was a church (St Mary’s) here perhaps built in 659, and possibly others in between, Lichfield is among the earliest centres of Christian worship in the UK. After the invasion of 1066 the Normans built a new cathedral (of which only few traces remain), and a century or so later that was rebuilt in the Gothic style, and completed by c. 1340. Besieged three times in the Civil War it suffered drastic damage, more than any other of our Cathedrals. Rapidly repaired in a mere nine years its interior was rearranged at the end of the eighteenth century, and then ‘restored’ in the 19th century by Sir George Gilbert Scott, and that is the Cathedral we have today. 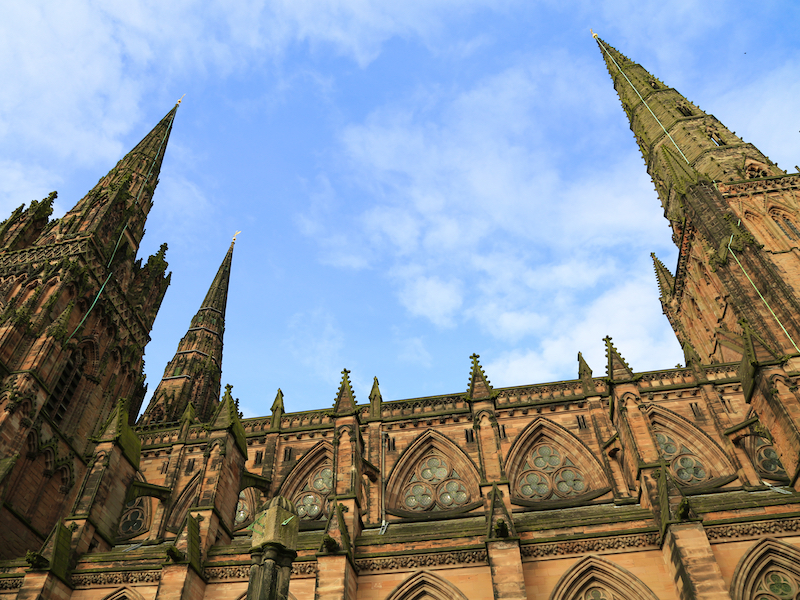 It is the only English medieval cathedral to have three spires – known locally as the ‘Ladies of the Vale’ – it is considered to be one of the most elegant in the country. 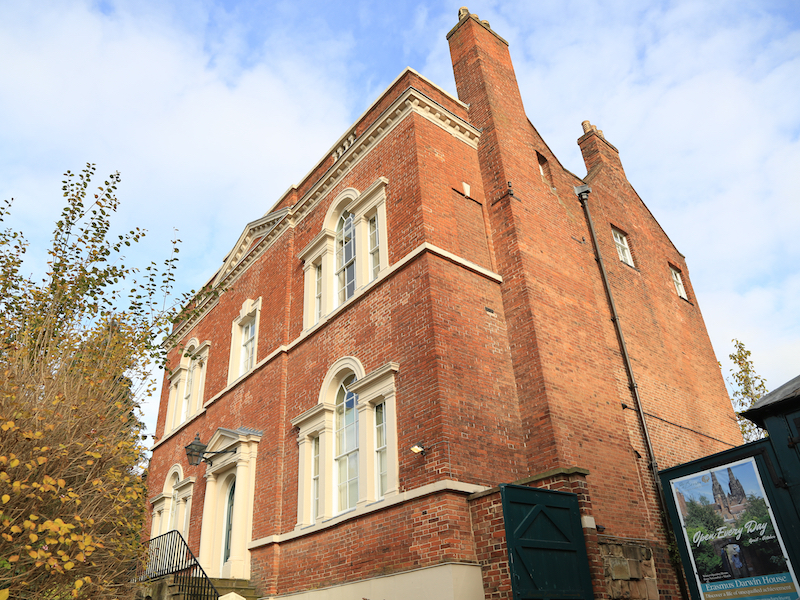 Darwin House is an independent, accredited museum that was once the family home of doctor, inventor, slave-trade abolitionist, and published poet Erasmus Darwin (1731 – 1802). 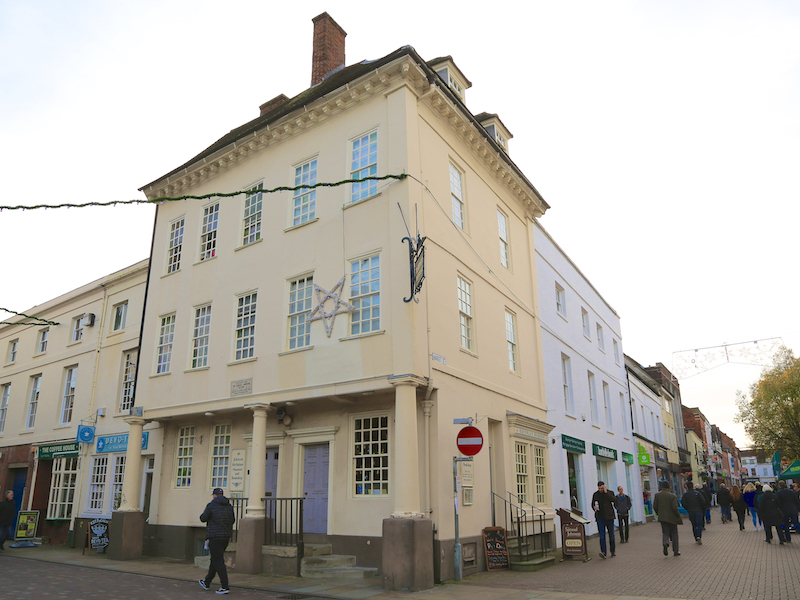 Located in Cathedral Close, the museum showcases the breadth of Darwin’s interests and achievements. He was one of the key thinkers of the Midlands Enlightenment. His poems included much natural history, including a statement of evolution and the relatedness of all forms of life. He was a member of the Darwin-Wedgwood family, which includes his grandsons Charles Darwin and Francis Galton. Darwin was a founding member of the Lunar Society of Birmingham, a discussion group of pioneering industrialists and natural philosophers. Darwin’s interests and achievements laid the foundations for his grandson and evolutionary biologist Charles. He turned down an invitation of George III’s to become a physician to the King. 7. At the T junction, turn right and walk along Beacon Street, passing Dimble House (1770) on the right and Dr Milley’s Hospital on the left. 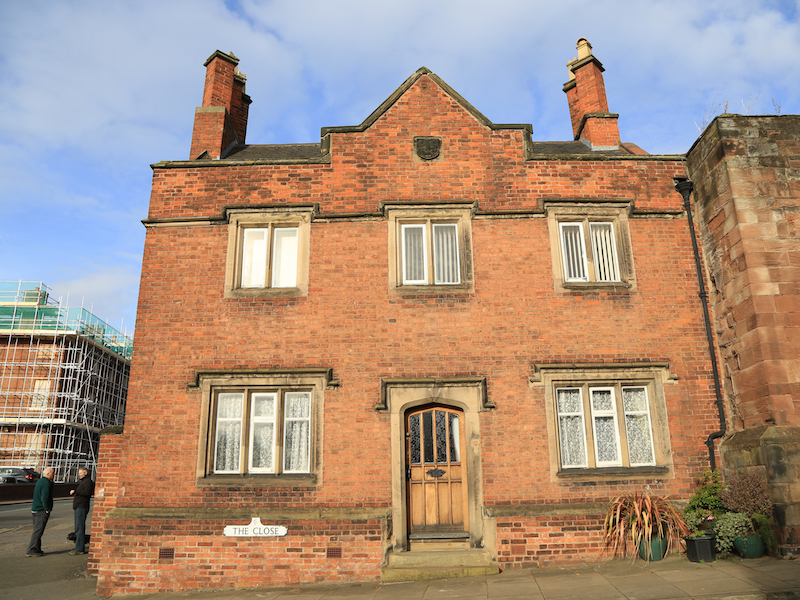 Dr Milley’s Hospital is an almshouse for women. 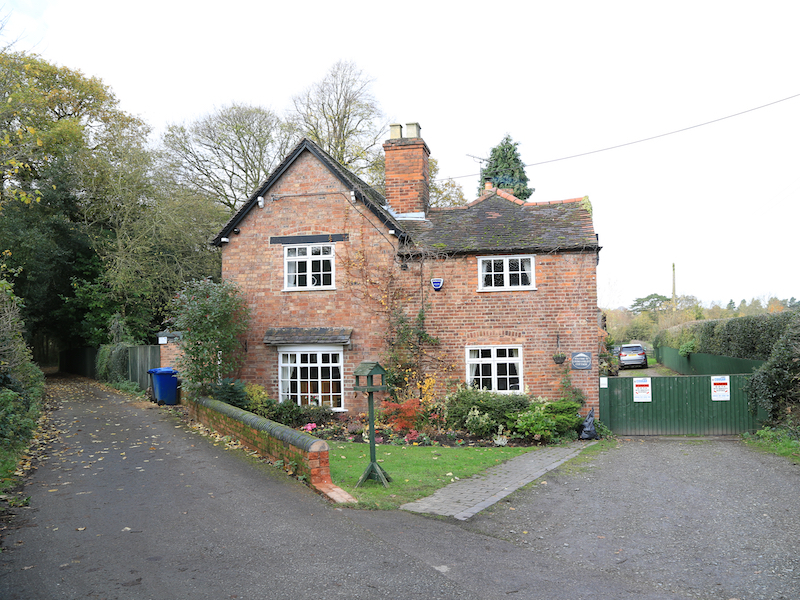 It was founded on property (situated in the town ditch) given by Bishop Heyworth in 1424 for the use of the poor. The land was given, it is believed, on condition that a red rose was given to the Bishop of Lichfield (if demanded) each year on St John Baptist’s Day, 24 June. It is not known when this custom ceased but it was revived in 1987 and the Bishop is now invited that day to receive 10 red roses, one for each resident. 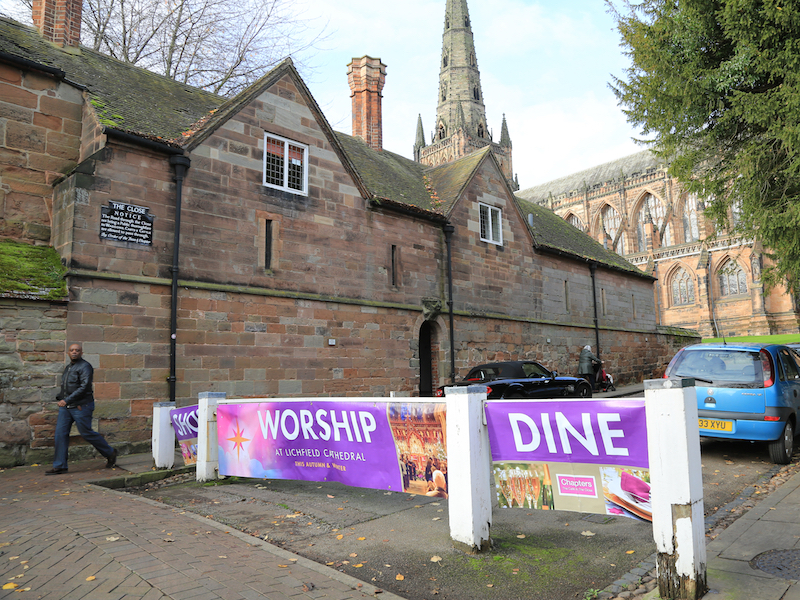 The hospital is named after Thomas Milley, a Canon residentiary of Lichfield Cathedral, who re-endowed and probably rebuilt the Hospital between 1502 and 1504. At that time it housed 15 poor women. Parts of the present building date back to 1652 (beams in upstairs corridor dated by dendrochronology) by which time the accommodation provided for only 10 residents. 8. On reaching the first crossroads (Gaia Lane on the right) turn left, crossing into Shaw Lane. On reaching the car park near the end of the lane, turn right following the walled path that’s signposted for the Heart of England Way. 9. 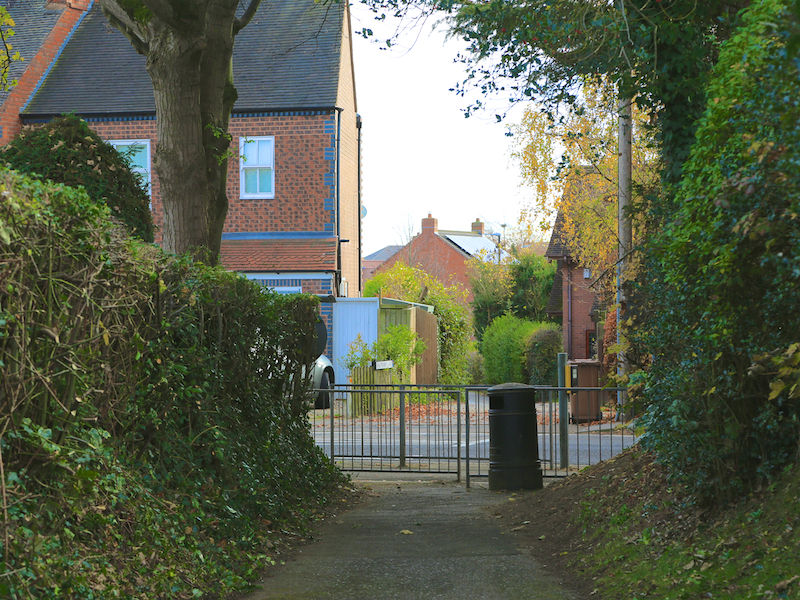 At the end of the walled path, continue straight ahead walking alongside the wall and hedge between the trees until reaching near to the edge of a car park. 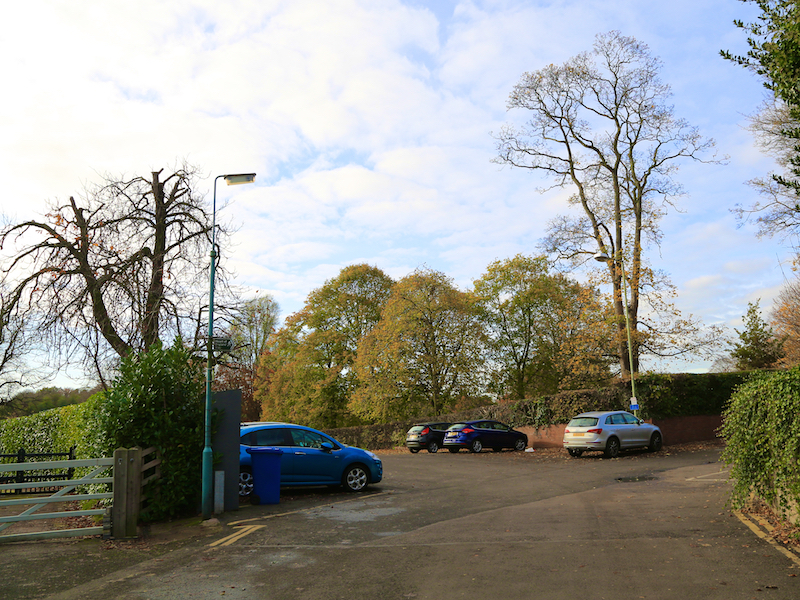 Crossing the corner of the car park, follow the path between the boundary of the park on the right and the golf course to the left. 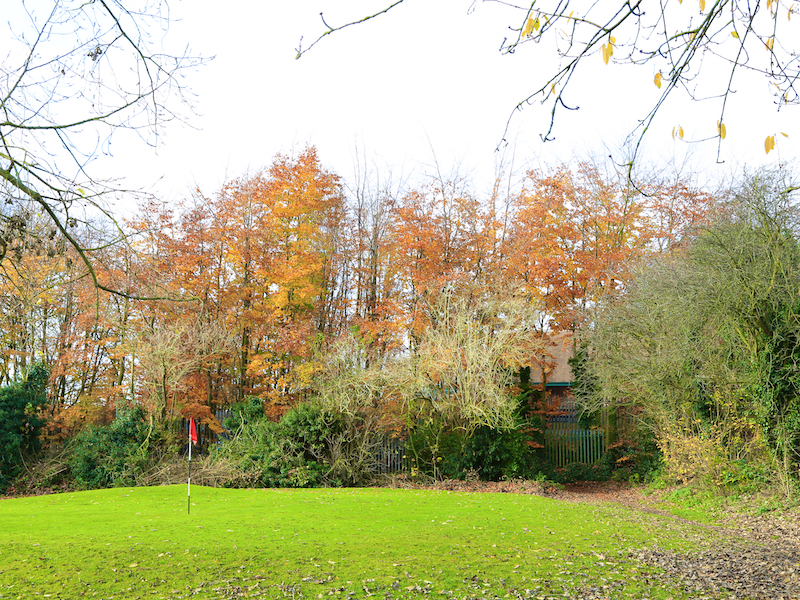 Go between the golf course and the supermarket, the path turns left alongside a row of trees, then right. 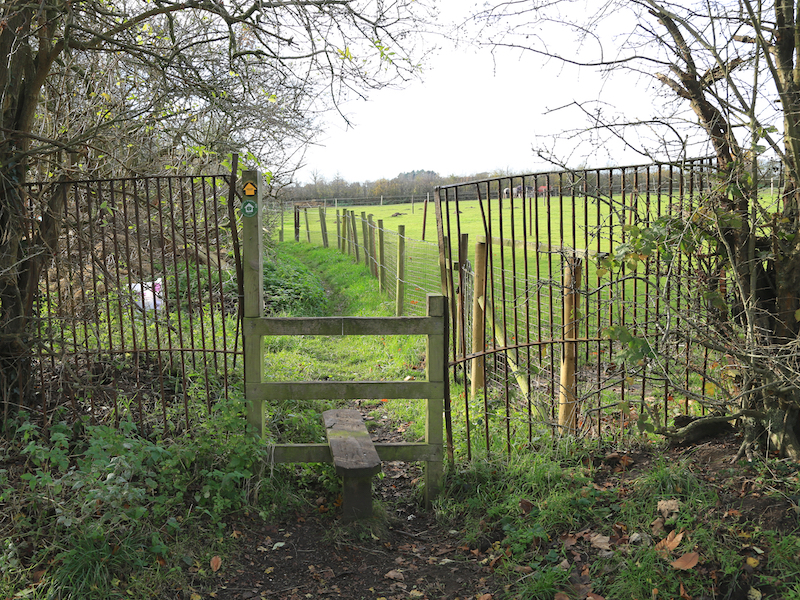 Cross the stile and continue along a narrow path flanked by a hedge and a wire fence. 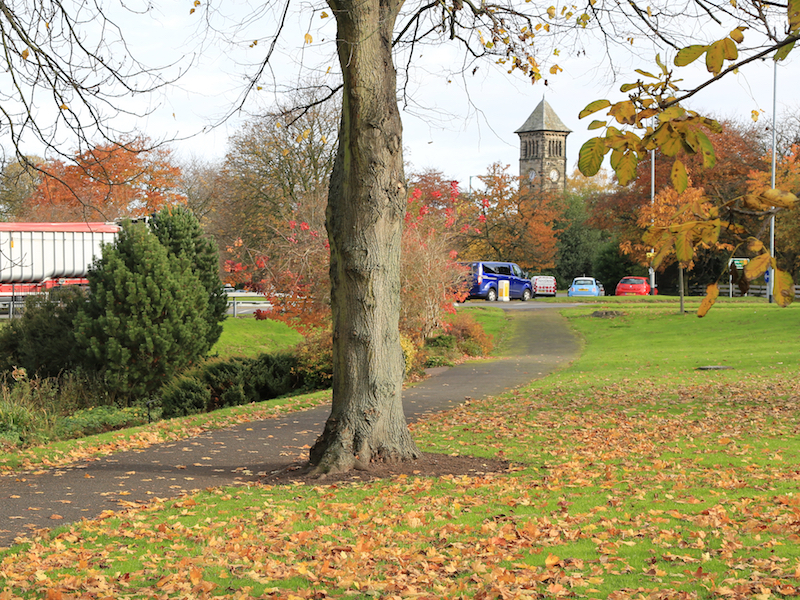 Beacon Park dates back to the late 1800s and is set in more than 70 acres of beautiful formal gardens and open spaces. 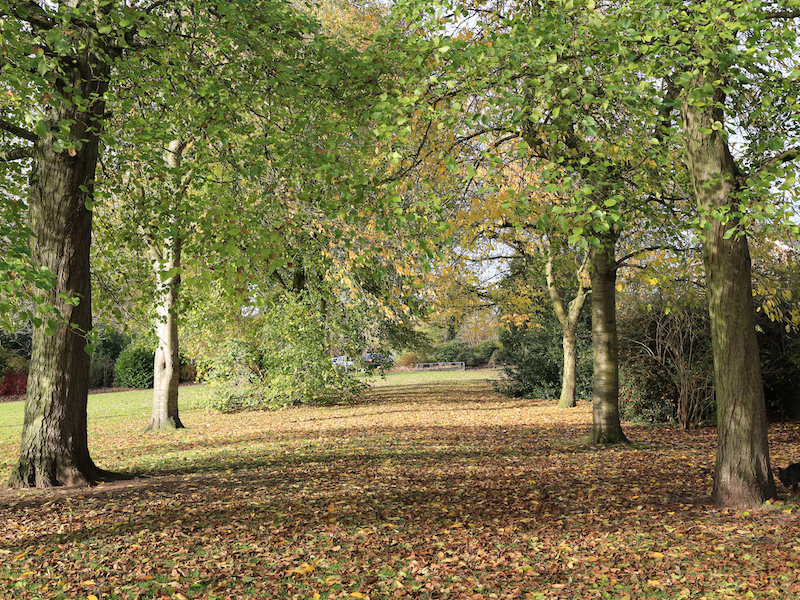 The park underwent extensive renovation in 2010 and 2011, with a multi-million pound lottery grant. The project helped to restore many of the park’s historic features as well as to develop new facilities, including a golf course. 10. 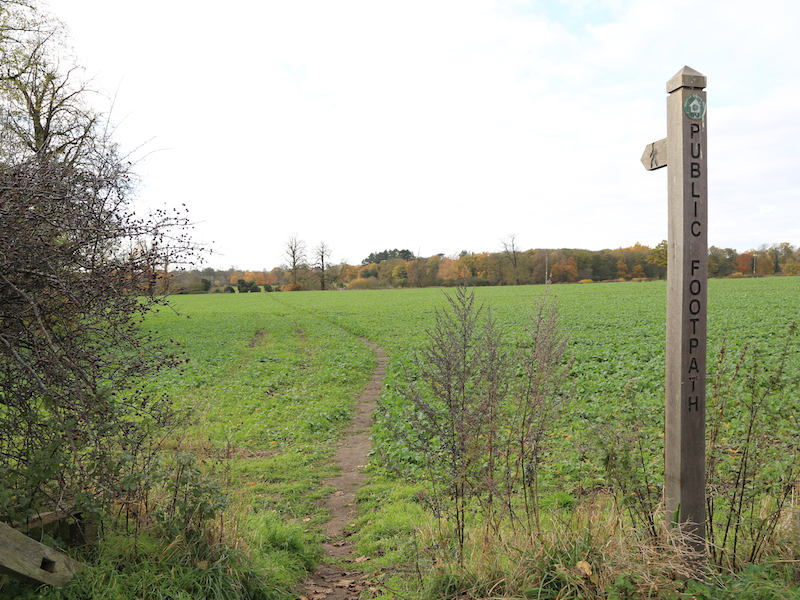 On reaching the main road (A51 Western Bypass), cross the road to join the signposted footpath (Heart of England Way) directly opposite that crosses a field. On reaching the hedge at the end of the field, pass through a wooden gateway and proceed straight ahead across the meadow (Pipe Green). Pipe Green is an area of meadowland that has been used since medieval times for animal grazing and, as a result, is one on the few remaining examples of unimproved meadowland within Staffordshire. 11. 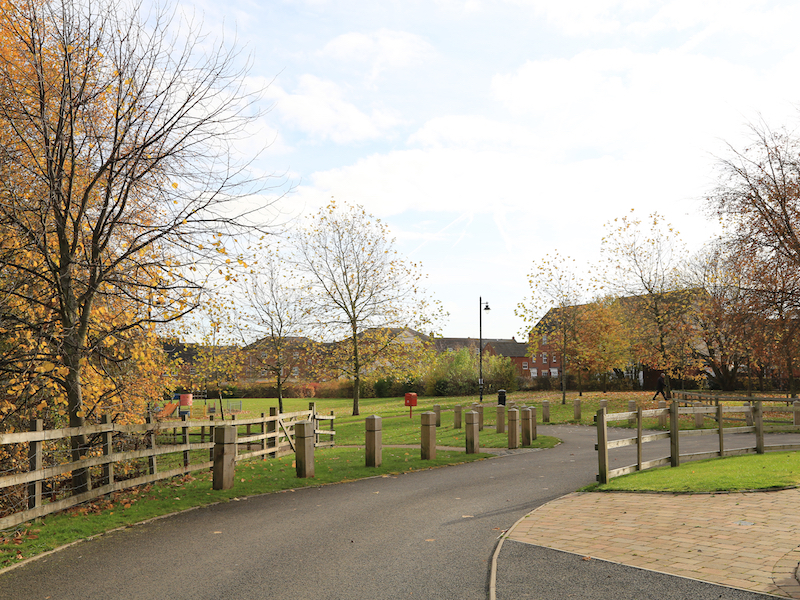 At the far side of the meadow, turn left to follow the path that runs parallel to the wooden fence and brick wall. Staying close to the wall, cross the stream and continue along the path until reaching the wooden gate that leads to a path alongside a narrow road. 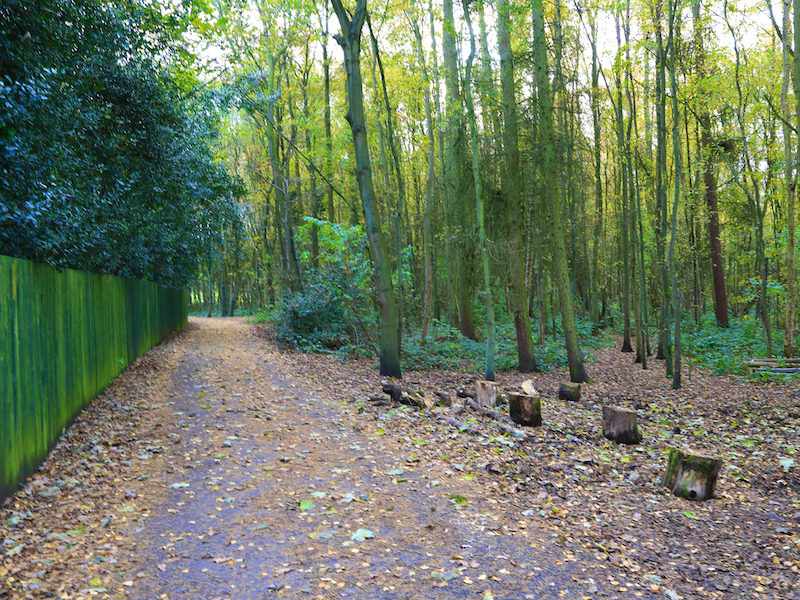 Turn left and then follow the path until it reaches the end of the wooden fence. Join the road and continue in the same direction keeping the woodland on the right. 13. 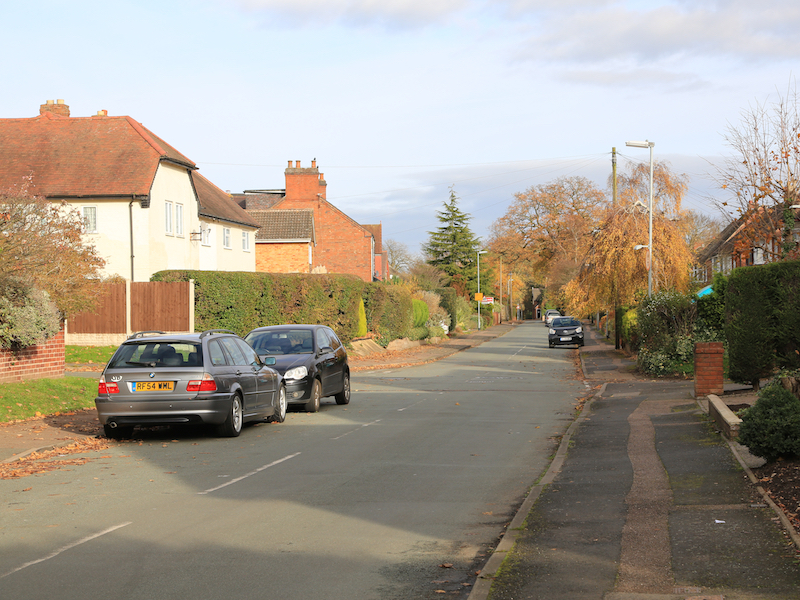 Continue along Christchurch Lane until reaching a path on the right, opposite Leomansley Road (signposted as motor vehicles and cycles prohibited) passing between some houses. 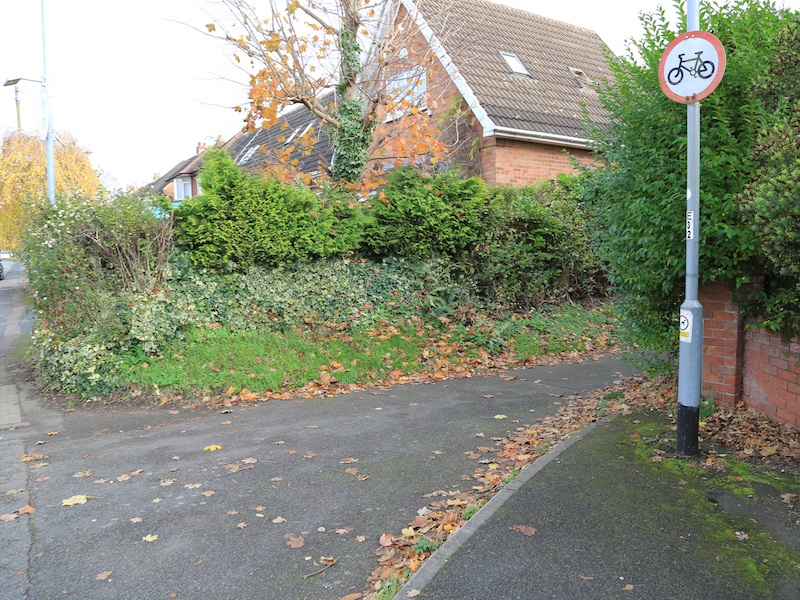 After a short distance, cross the road at a pedestrian crossing and join Halfpenny Lane straight ahead. 14. 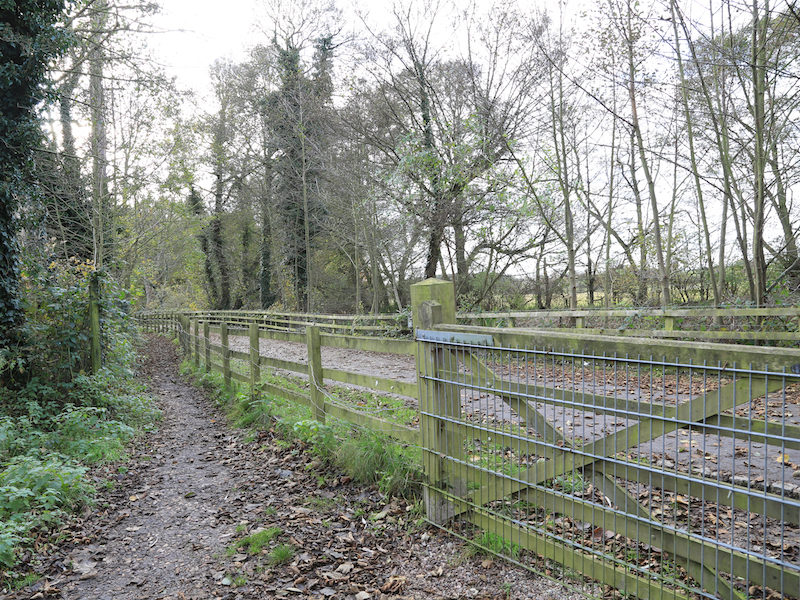 At the end of the lane, bear left and join the path alongside the wooden fence by the pool on the left (Trunkfield Brook). (There is a small playground to the right.) Continue along this waterside path and after crossing a road (Blakeman Way), continue along the path that continues waterside. 15. 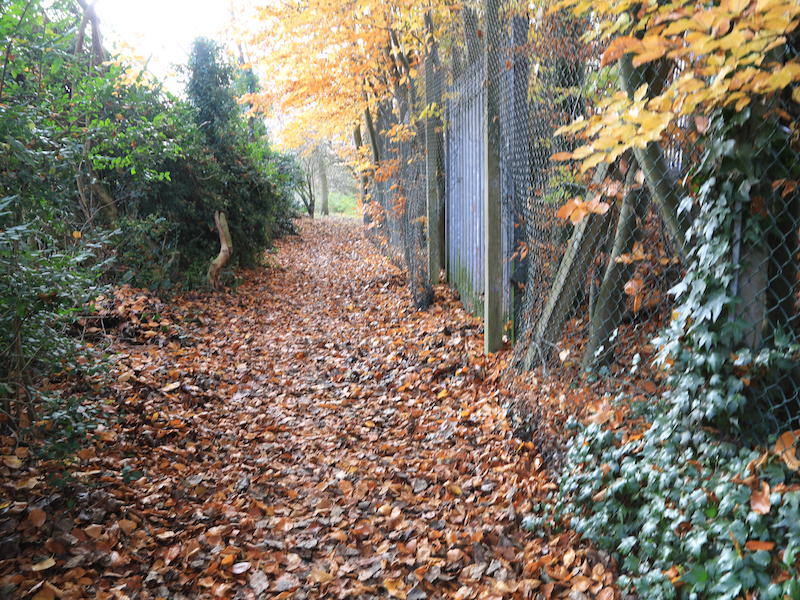 Just after the path bears right and away from the waterside, it meets another path (Cathedral Walk) at a T junction. 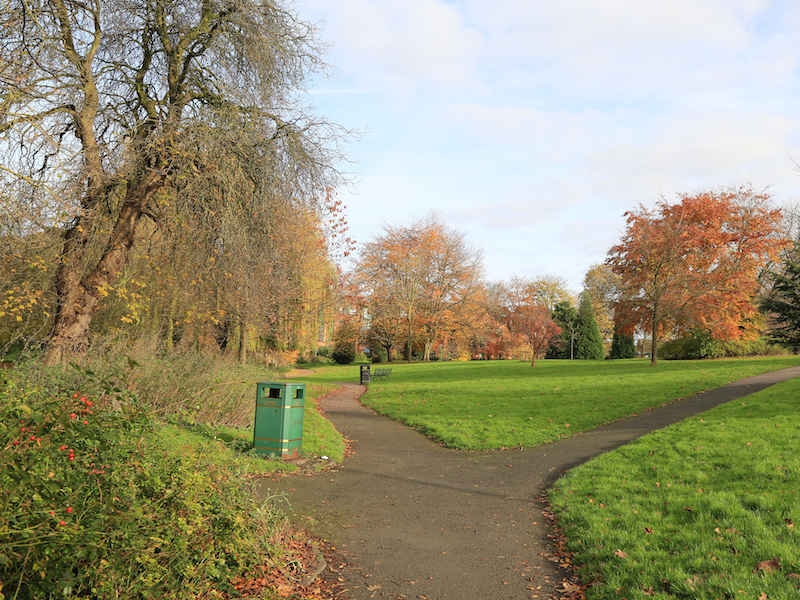 Turn left and follow this path until it reaches a main road (Friary Road) near to a large roundabout. Turn left and cross the road at the pedestrian crossing. 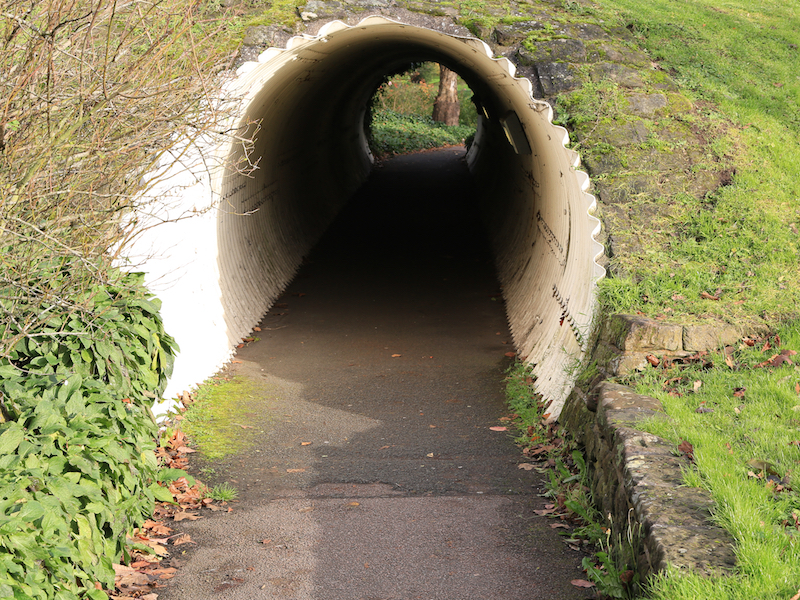 At the other side, take the path that bears to the right and then the path on the left that goes through the tubular underpass. 16. 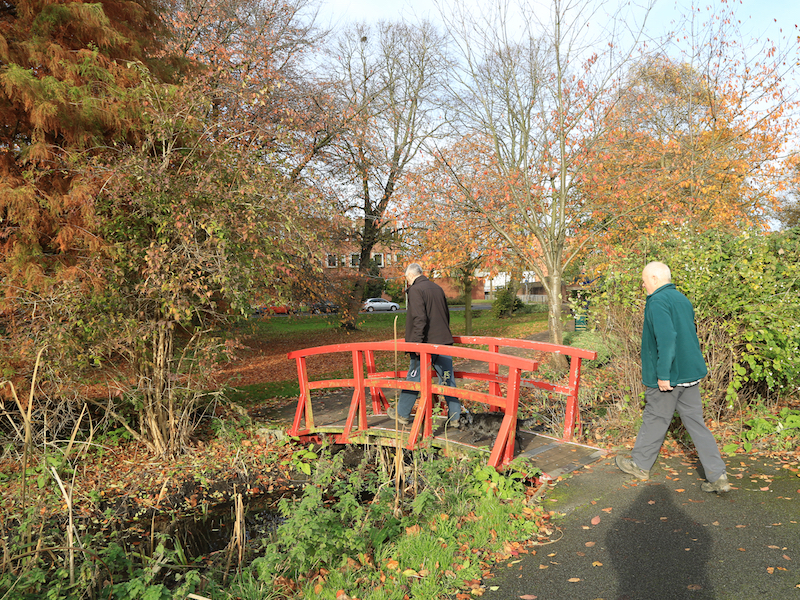 Continue along the path straight ahead at the footpath crossing and then cross the brook using the small wooden footbridge. 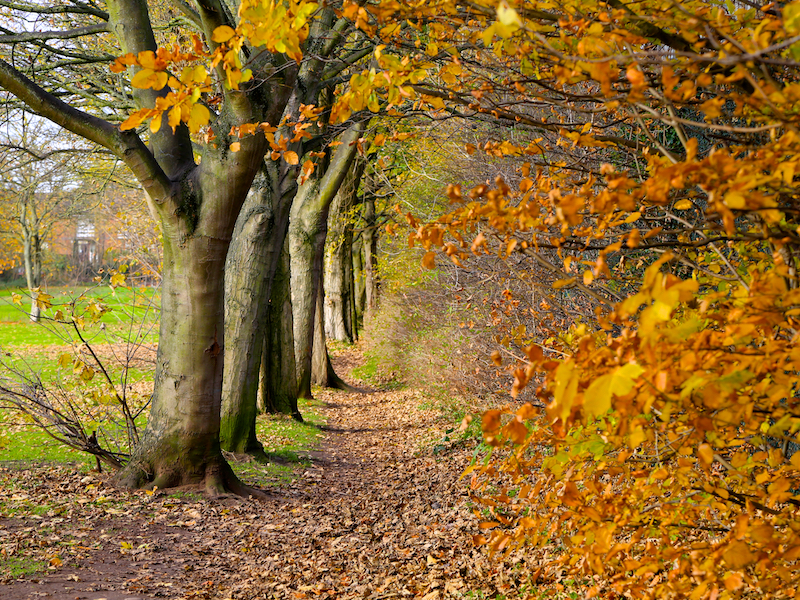 Follow the path as it bears to the right. On reaching the road (Queen Street), turn right. 17. Cross the junction with Swan Road and continue along Sandford Street. 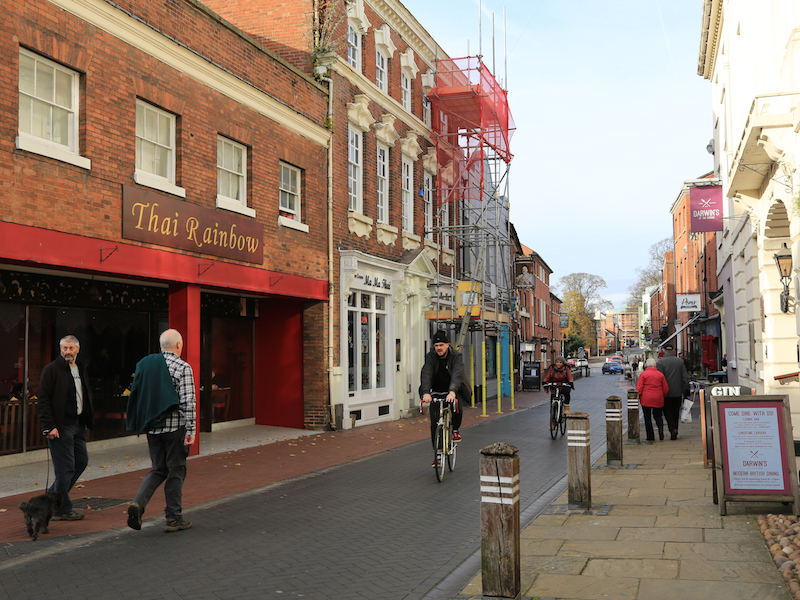 At the T junction with Bird Street, turn left and continue along until the end of the pedestrianised section of the road. Cross and continue ahead along Bird Street until reaching the path on the right immediately before the water (Minster Pool). George Hotel and Louis Paulhan: In late April 1910, Staffordshire found itself the scene of some dramatic developments in the race between an Englishman and a Frenchman for a £10,000 prize. The prize money had been offered by the Daily Mail almost four years earlier for the first aviator to complete a flight between London and Manchester ( where the newspaper had its main offices) within a 24 hour period. 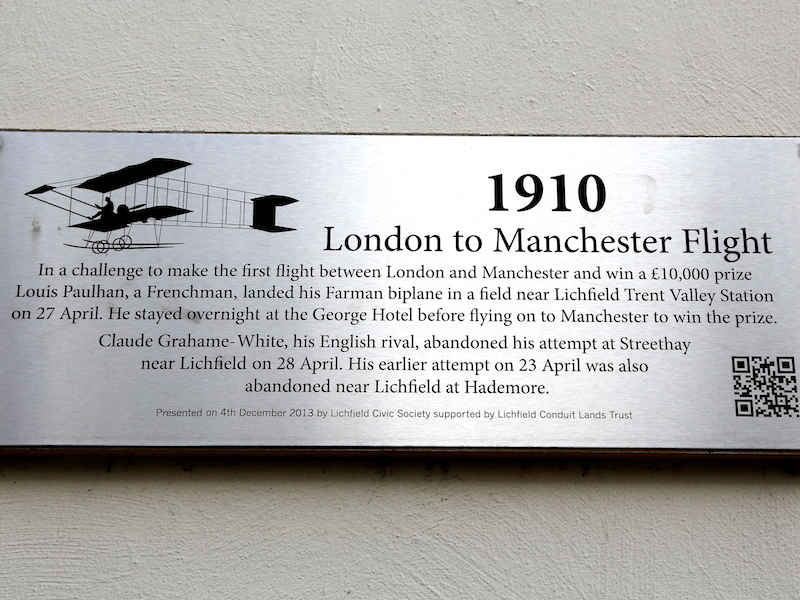 The first attempt to win the prize was made by Englishman Claude Grahame-White, but his attempt failed after he landed in a field at Hademore Crossing near Lichfield where his plane was blown over in high winds. Grahame-White struggled with engine problems as he entered the Trent Valley and despite attempting to catch Paulhan by engaging in a very risky night flight, his attempt to win the prize only got as far as Whittington, where he landed near to where his first attempt had failed. Louis Paulhan flew on the Manchester where he claimed the prize. The air race caused much excitement in Staffordshire, where huge crowds turned out just after dawn to watch the aircraft fly overhead, following the line of the railway. Mural of Samuel Johnson: located at the end of the pedestrianised section of Bird Street, a mosaic by the artist John Myatt is based on a portrait of Dr Johnson by Sir Joshua Reynolds. 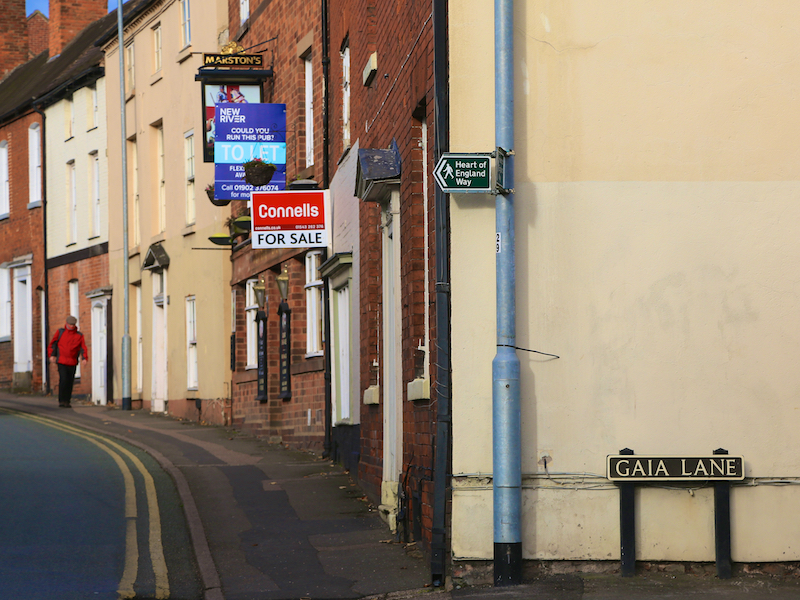 It was donated to Lichfield in June 1976 by Lichfield District Arts Association and Berger Paints. The mosaic depicts the recognisable face of Samuel Johnson in small blocks painted in a variety of colours. 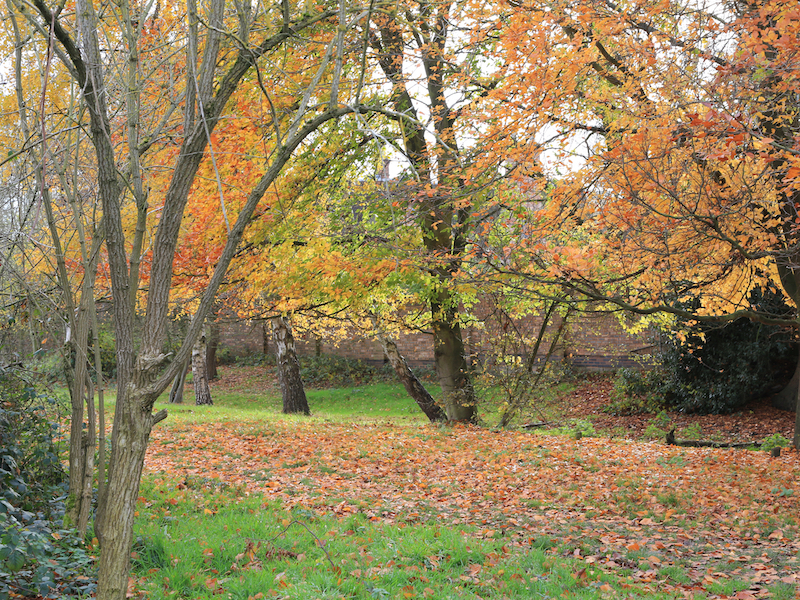 Museum Gardens were first created as an informal park in the late 1800s. The land was once part of Minster Pool until a causeway was built, on what is now part of Bird Street, and it became known as Bishop’s Pool (or Upper Pool). This pool silted up over time and was eventually filled in. Museum Gardens opened as a public park in 1859. Originally incorporating ornamental pools and avenues of trees, the gardens were designed to complement the Italianate architecture of the adjoining Free Library and Museum. 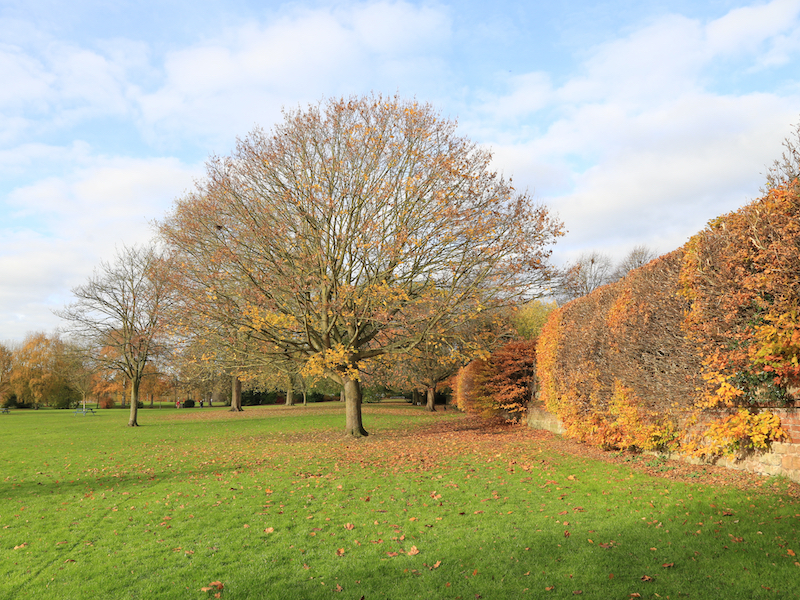 Garden of Remembrance: In the early 1300s, a crenellated wall surrounded Cathedral Close and formed part of the cathedral’s fortifications. The wall passed through the centre of what is now the Garden of Remembrance. 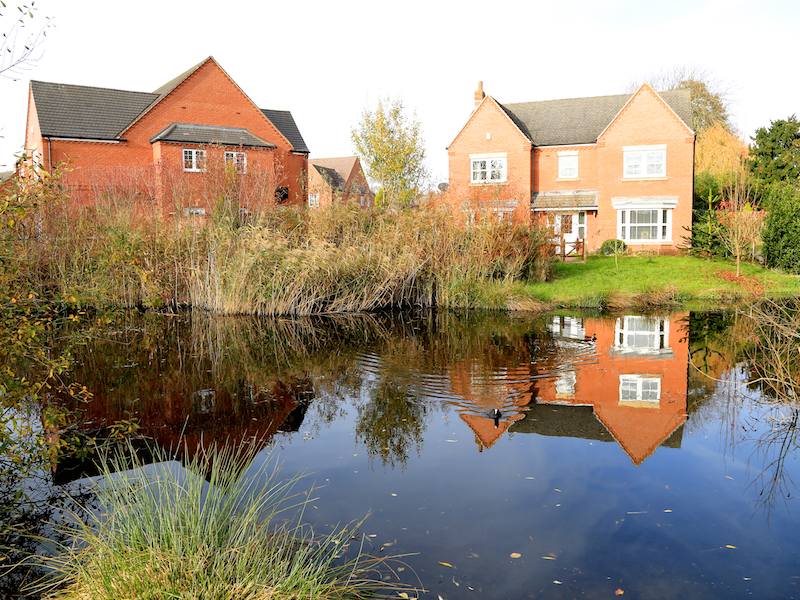 Over time, as parts of Minster Pool silted up, the area of land where the garden now stands doubled in size. Through the years, it has been used for a variety of purposes, including livestock grazing. 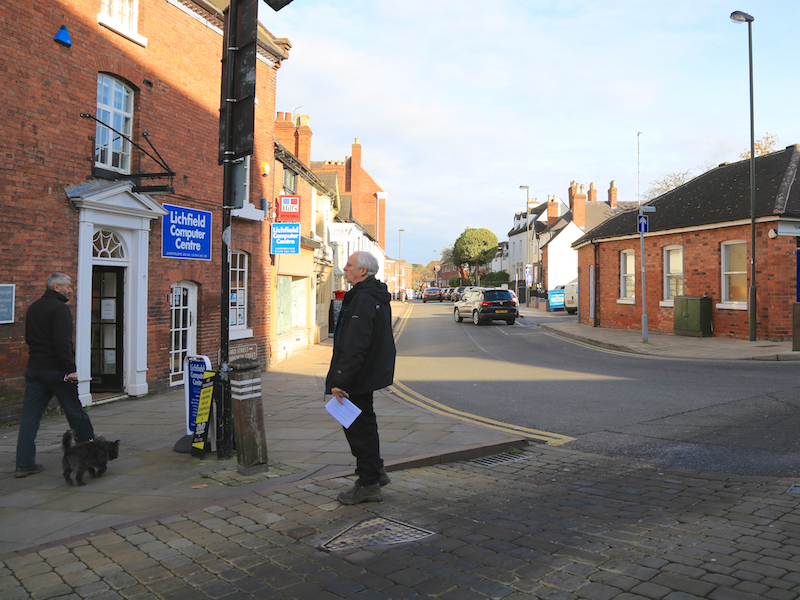 Following the First World War, the people of Lichfield were anxious to create a memorial to those who had lost their lives. The War Memorial was designed by the prominent architect, Charles Edward Bateman, and created by local stonemasons, Bridgeman and Sons. Carved from Guiting stone, with the central figure of St George sculpted in Portland stone, the memorial is the focal point of the garden. Work on laying out the garden began in 1919. The stone lions on the gate piers reputedly came from Moxhull Hall in Warwickshire and the 18th century stone balustrades and plinth came from Shenstone Court, just outside Lichfield. 18. 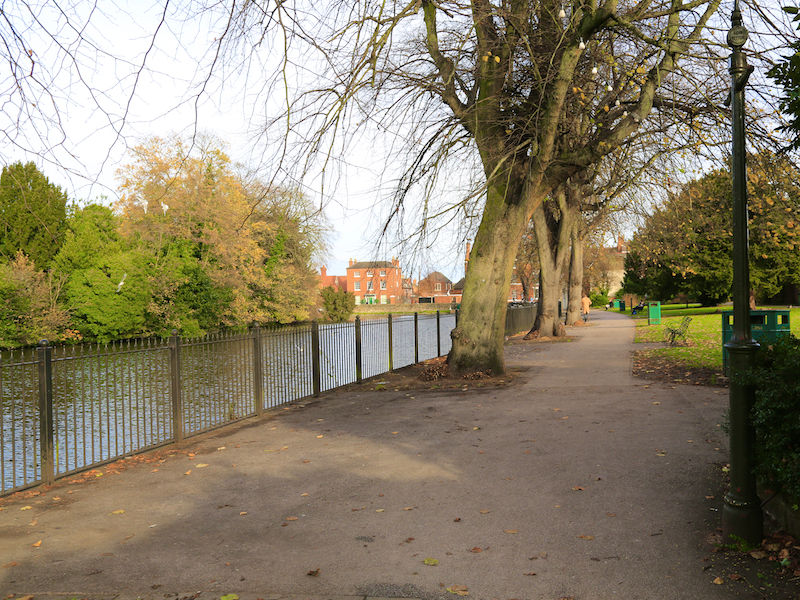 Take this path (Minster Pool Walk) and continue until reaching the far end of the water and then turn right (signposted for City Centre & Shops) into Dam Street. Minster Pool is fed by Leomansley and Trunkfield brooks. It is thought to have been created or extended during the 12th and 13th centuries, although evidence suggests that a body of water existed in the area from the early medieval period. A natural pool was probably enlarged by creating a dam towards the later named Dam Street, to provide power for a mill and to create a fishpond. At the start of the 14th century, under the orders of Bishop Walter Langton, a causeway was built on what is now Bird Street, dividing a much larger pool in two. These became known as Minster Pool to the east and Bishop’s Pool (or Upper Pool) to the west. This latter pool silted up over time and was eventually filled in to create Museum Gardens, which opened in 1859. The remains of Langton’s bridge is still below the replacement Causeway Bridge that was built in the 1760s, and again in 1817, to allow coaches to travel across. This grade II listed bridge was created by the architect Joseph Potter (Sr), who also supervised alterations to the cathedral. During the Civil War, in the three sieges of Lichfield Cathedral between 1643 and 1646, Minster Pool’s defensive role was tested by both Royalist and Parliamentarian forces who in turn garrisoned and besieged the cathedral. Inspired by a visit in 1772 to The Serpentine in London’s Hyde Park, the poet Anna Seward was instrumental in landscaping Minster Pool to give it a serpentine shape and in developing New Walk, later renamed Minster Pool Walk. 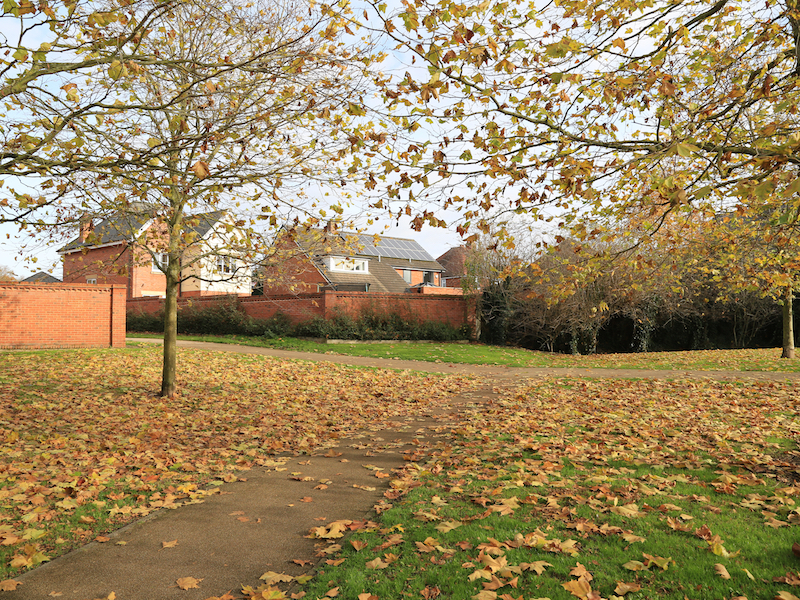 The Memorial Garden was laid out in 1955 in memory of Lichfield citizens who died in the Second World War and later conflicts. The garden was created by using land from the long gardens of houses on Market Street. 19. 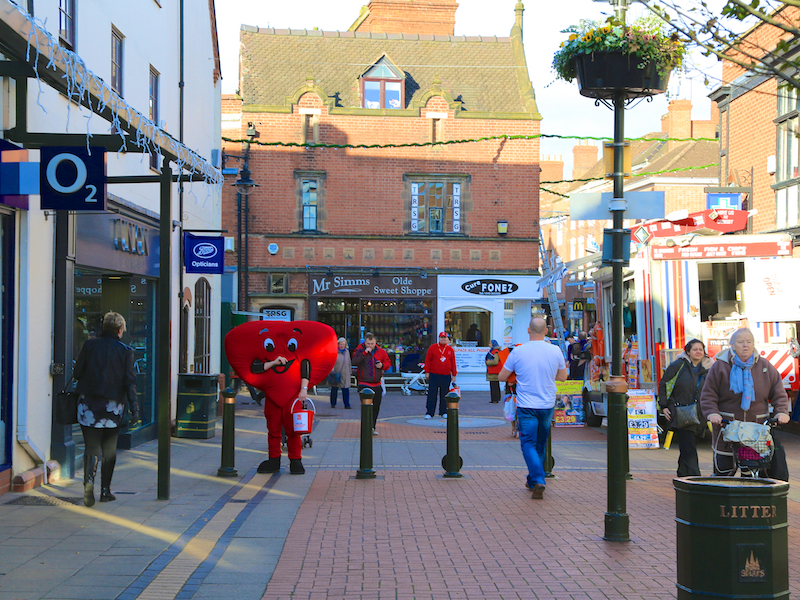 Continue along Dam Street until reaching the market square located alongside St Mary’s Centre. Turn right into Market Street and continue along to the end where it meets Bird Street. 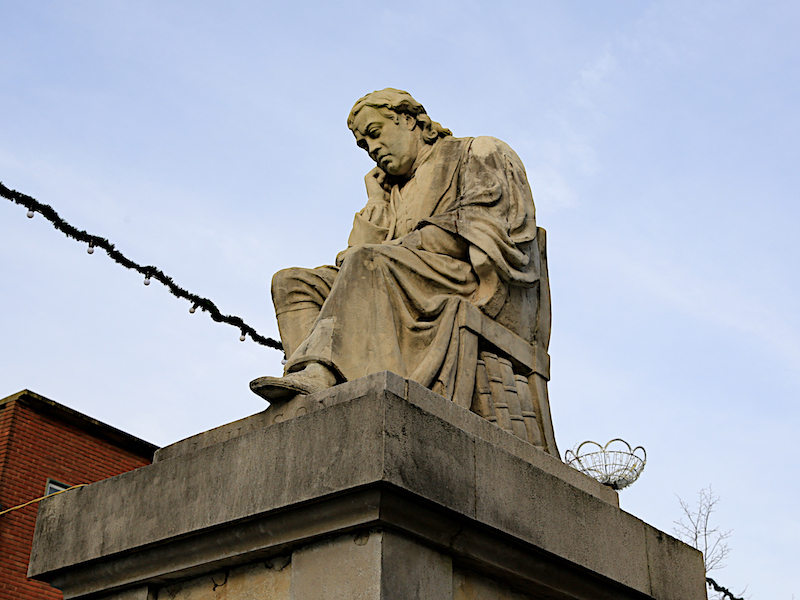 Samuel Johnson – sitting upon his chair with all his volumes underneath him, deep in scholarly thought overlooking the house in which he was born. Sculpted by Richard Cockle Lucas in 1838 in Ashlar stone. 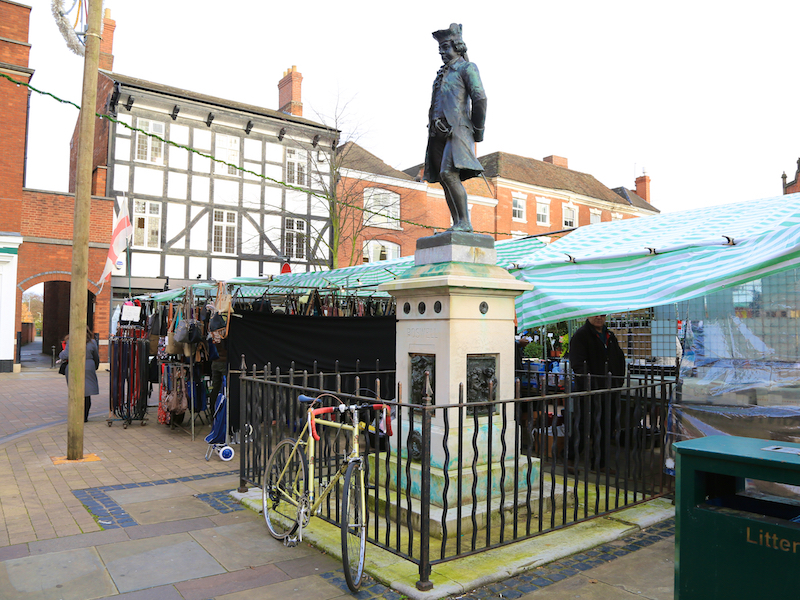 James Boswell – seen with a sword, notebook and stick standing on his tall plinth in the market square next to where Dr Johnson is seated. The Bronze statue was sculpted by Percy Hetherington Fitzgerald and is 1.9metres high upon a black marble base stone on top of a 1.8m portland stone plinth. Presented to the city in 1908. Samuel Johnson (1709 – 1784), often referred to as Dr. Johnson, was an English writer who made lasting contributions to English literature as a poet, essayist, moralist, literary critic, biographer, editor and lexicographer. Johnson was a devout Anglican and committed Tory, and is described by the Oxford Dictionary of National Biography as “arguably the most distinguished man of letters in English history”. He is also the subject of the biography, The Life of Samuel Johnson by James Boswell. After nine years of work, Johnson’s A Dictionary of the English Language was published in 1755. It had a far-reaching effect on Modern English and has been acclaimed as “one of the greatest single achievements of scholarship”. This work brought Johnson popularity and success. Until the completion of the Oxford English Dictionary 150 years later, Johnson’s was the pre-eminent British dictionary. His later works included essays, an influential annotated edition of The Plays of William Shakespeare, and the widely read tale The History of Rasselas, Prince of Abissinia. In 1763, he befriended James Boswell, with whom he later travelled to Scotland; Johnson described their travels in A Journey to the Western Islands of Scotland. Towards the end of his life, he produced the massive and influential Lives of the Most Eminent English Poets, a collection of biographies and evaluations of 17th- and 18th-century poets. James Boswell, 9th Laird of Auchinleck (1740 – 1795), was a Scottish biographer and diarist, born in Edinburgh. He is best known for the biography he wrote of one of his contemporaries, the English literary figure Samuel Johnson, which is commonly said to be the greatest biography written in the English language. Edward Wightman was the last person burned at the stake for heresy in England. He was well-known in Puritan circles in Burton upon Trent in the early 1600s, where he began proclaiming increasingly heretical opinions. He reportedly did not believe that human souls went to heaven or hell after death but remained with the body in the grave until the Day of Judgment. As his pronouncements grew odder and odder, his Puritan friends remonstrated with him in vain and he attracted the attention of the authorities. In 1611 he spent months in prison, interrogated at intervals by the Bishop of Lichfield, Richard Neile, and William Laud (the future Archbishop of Canterbury) among others. Wightman seems to have denied the doctrine of the Trinity, denied that Jesus Christ was God, denied the Resurrection and the legitimacy of Holy Communion and maintained that he himself was both the Holy Spirit and, though not himself divine, the Messiah appointed by God as the saviour of the world. From a modern perspective it seems clear that he had gone completely insane. 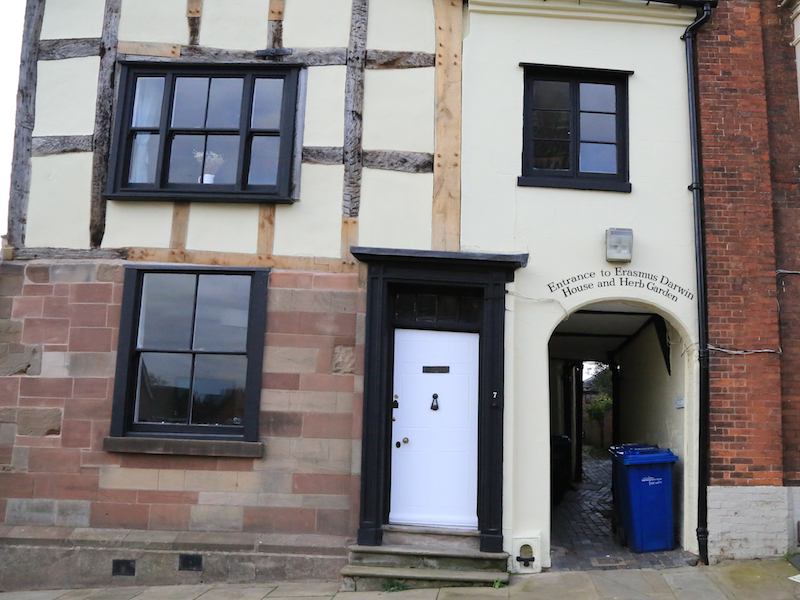 Wightman was eventually put on trial in the diocesan court in Lichfield, which in December pronounced him guilty of blasphemy and of promoting the heresies of figures ranging from Simon Magus to the Arians, the Manicheans and the Anabaptists. 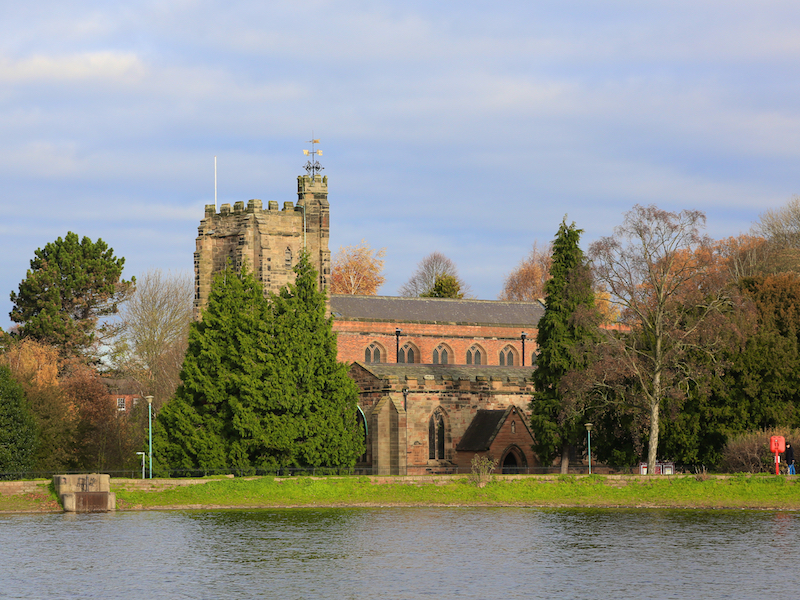 He was sent to the stake in the square in Lichfield in March 1612. When the flames began to scorch him he cried out in pain and it was thought he wanted to recant. Some of the crowd of spectators rushed to rescue him, though getting burned themselves. He was taken back to prison to recover, but when he was brought before the court again he refused to sign a formal recantation and on Easter Saturday in April he was sent back to the stake and was this time burned to death. 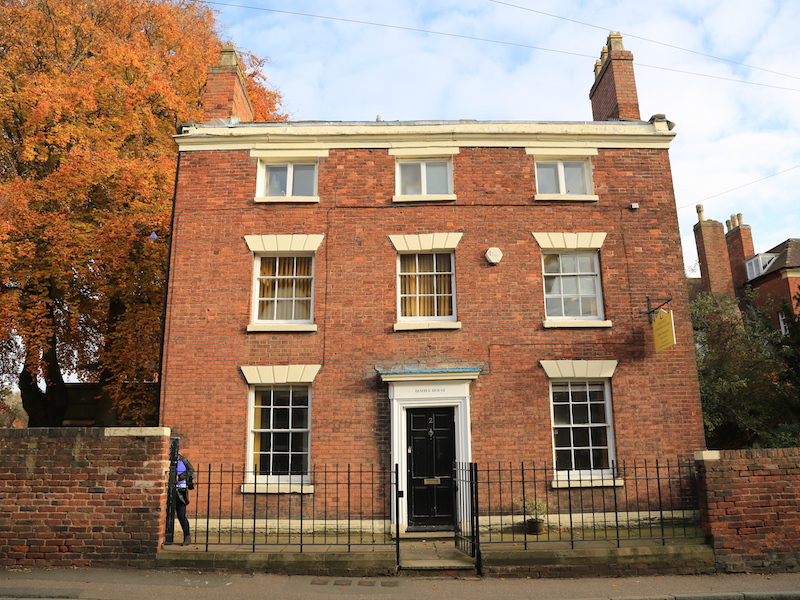 Samuel Johnson’s Birthplace has been a Museum to the writer and his times since 1901. 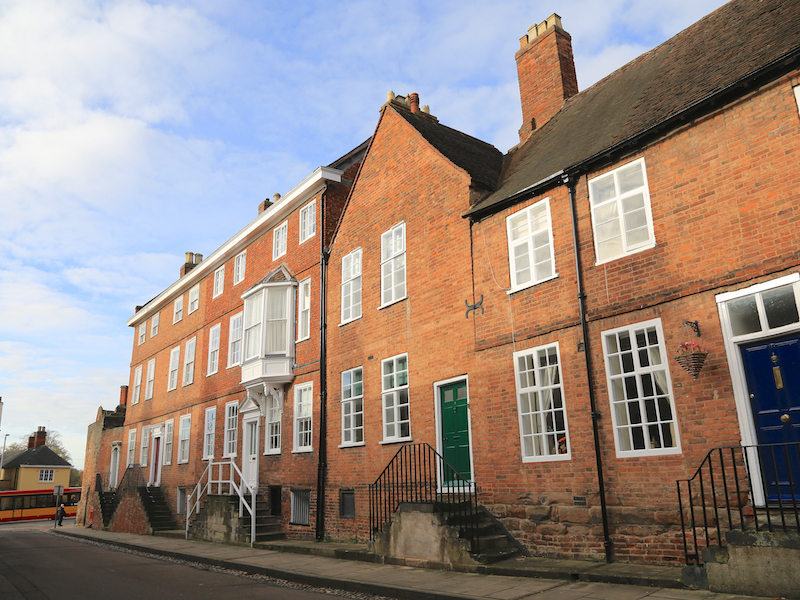 The house was built for Johnson’s parents Sarah and Michael in 1708, and the family ran their bookshop business on the ground floor. Now a Grade I listing building, the Birthplace is a museum with events and activities throughout the year. 20. 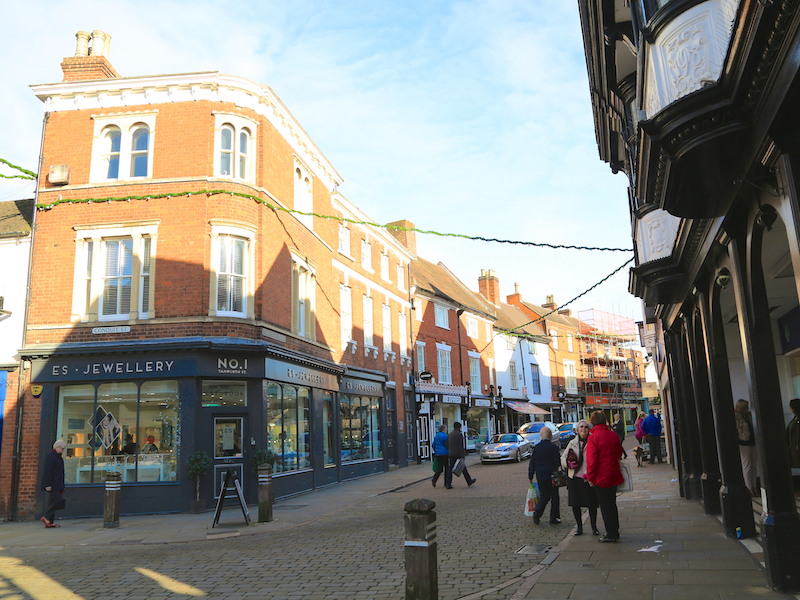 Turn left (Bird Street) and on reaching the end of the pedestrianised section, turn left into Bore Street. 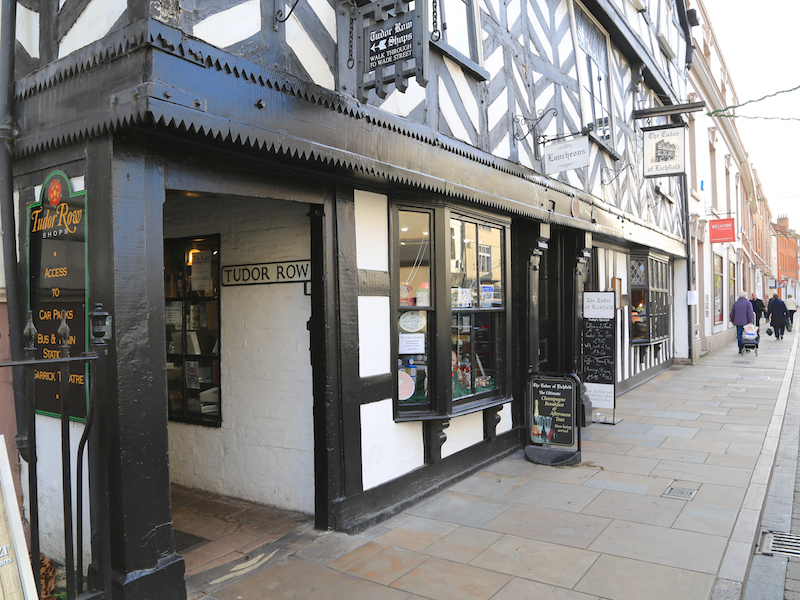 On reaching the large black and white building that houses the Tudor of Lichfield Cafe, enter the small entrance at the far end of the building that is signed as Tudor Row Shops. Just beyond the cafe is The Guildhall, a venue for concerts and other events. 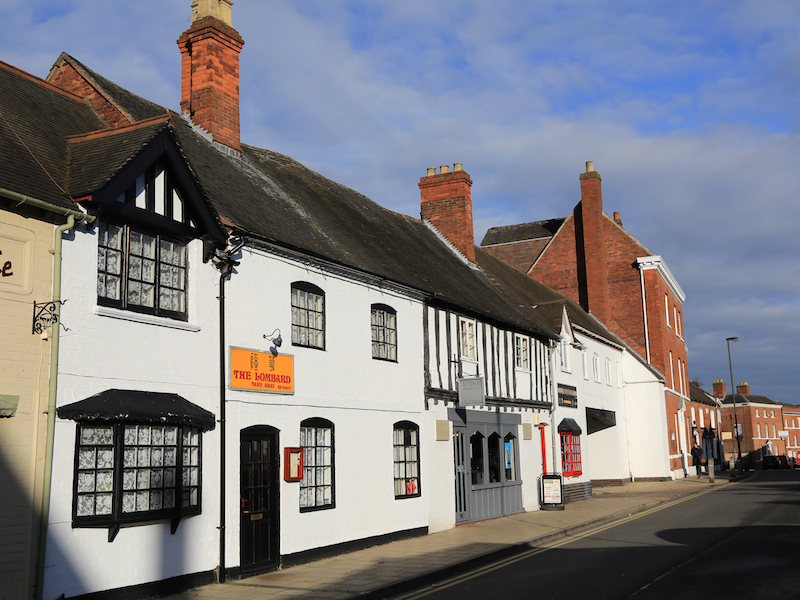 The Guildhall has been central to the government of the Lichfield for over 600 years, and in former times was not only the meeting place of the Corporation but also at various times the court, prison, police station, theatre and fire station. 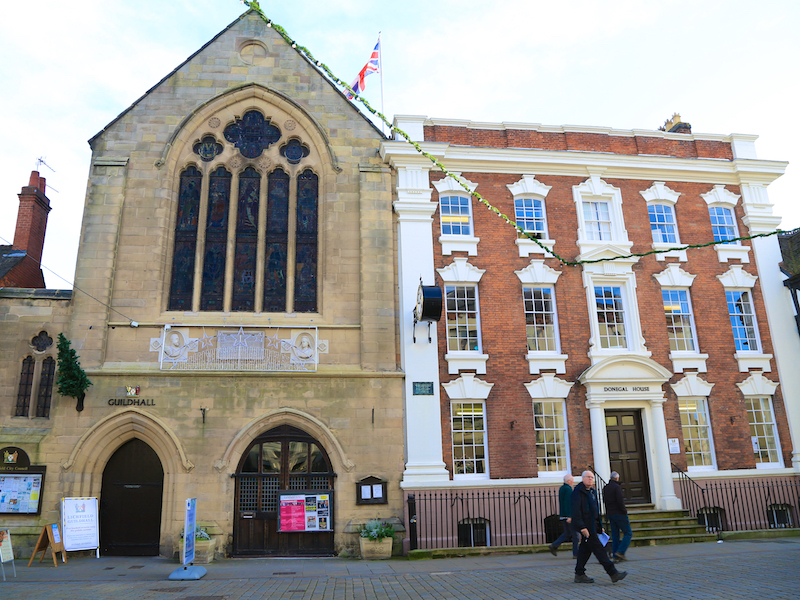 The Guildhall takes its name from the ancient Guild of St Mary and St John the Baptist, whose hall stood from very early times on this site. 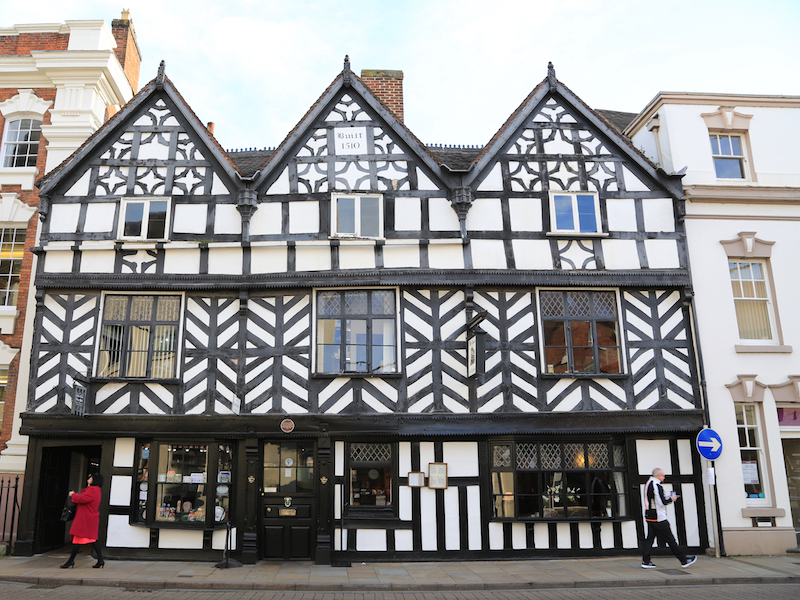 It is not known when the first Guildhall was erected but it is believed to have been around 1387, when Richard II confirmed the incorporation of the Guild which even then had been in existence for many years. The Guildhall is a Grade II Listed Building. At the north end, on Bore Street, there is a large stone tracery stained-glass window. This was originally in the north transept of the Cathedral and was transferred to the Guildhall in 1891. 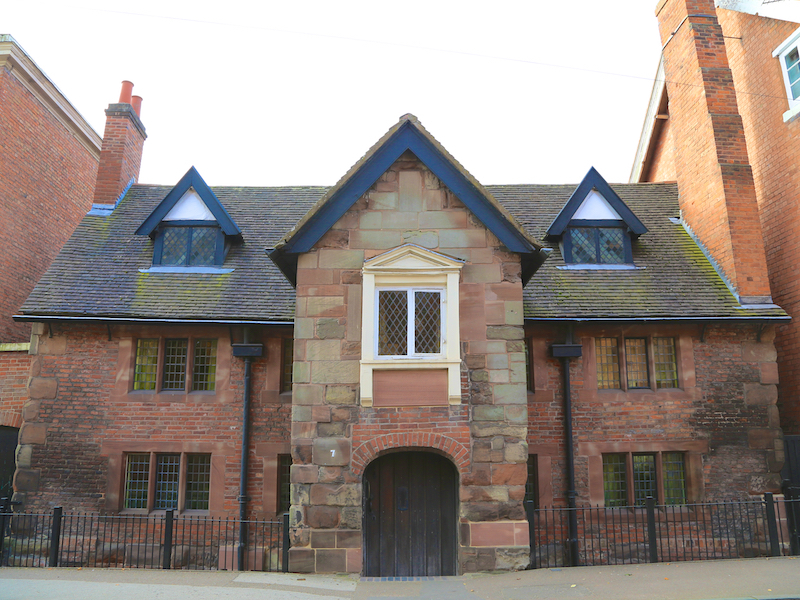 The old prison for felons and debtors is at the rear of the building and has been in existence since 1553. 21. 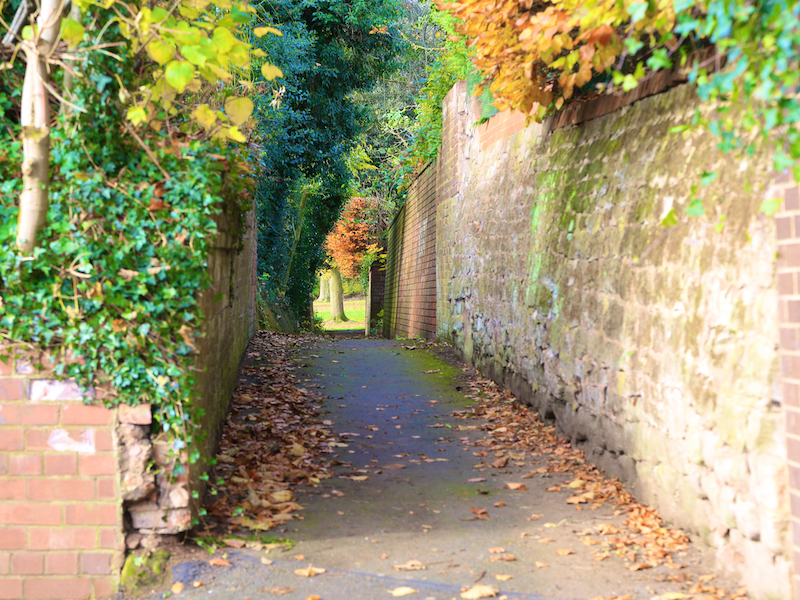 On reaching Wade Street at the end of the passageway, turn left and then almost immediately turn right (just before Lichfield Garrick Theatre) to head along Castle Dyke. At the junction (with Frog Lane) where the road turns to the right, continue along the path that runs straight ahead until it reaches the bus station. 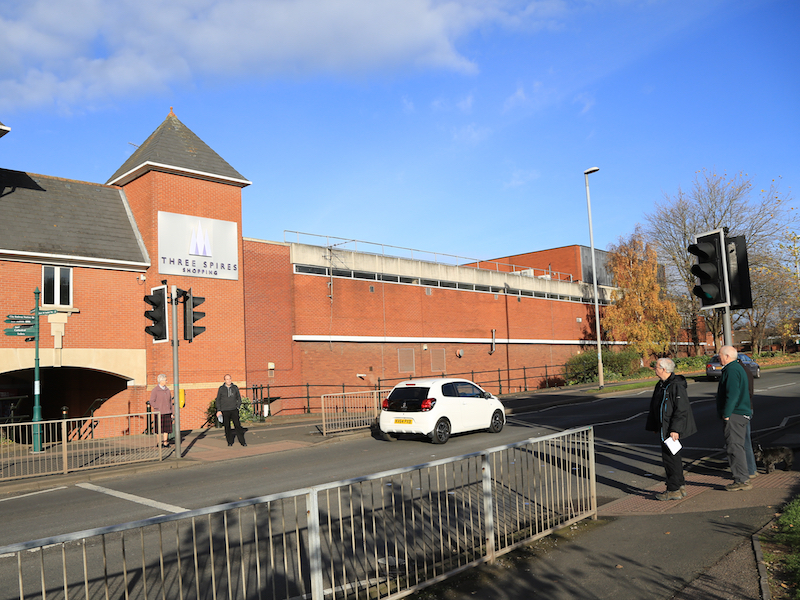 At this point, turn right and follow the path at the edge of the bus station until it reaches the main road (A5127 Birmingham Road). 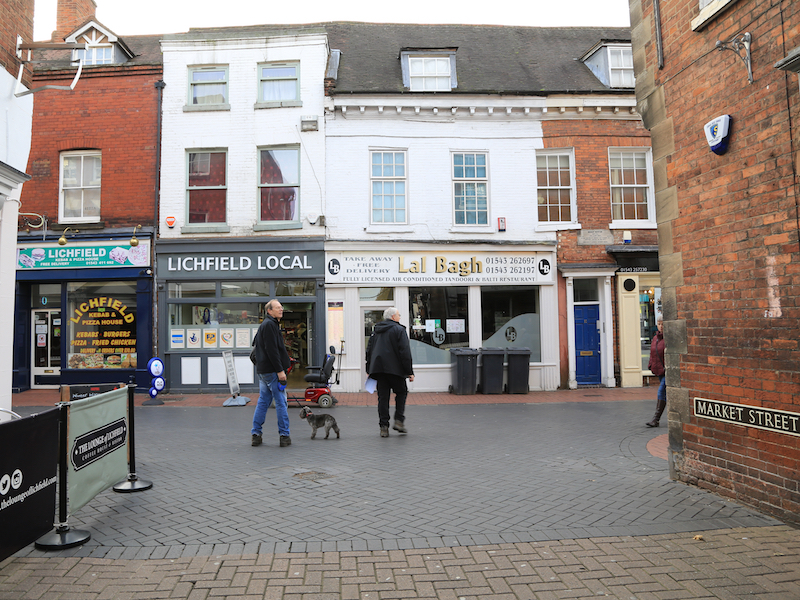 Turn right and then use the pedestrian crossing to return to the start point outside Lichfield City station.